In the Paleo community, we are accustomed to assuming that a standard Paleo diet will cure (or at least significantly improve) virtually every health problem. But, if you have psoriasis (or dermatitis or eczema), be prepared: Paleo not only may fail to resolve these skin conditions, it might even make it worse. Now, don’t go running for the hills. The principles behind the Paleo diet are still sound. It is still the best way to eat for your long-term health. And there are certainly some people who find complete resolution of their psoriasis symptoms with the switch to a Paleo diet (for those people, the root cause of the psoriasis is typically a gluten sensitivity). For me (and for many others), switching to Paleo made my psoriasis worse. This isn’t because Paleo has us on the wrong track; it’s simply because out-of-the-box Paleo is not actually enough. I am a long term sufferer of lichen planus, a form of psoriasis where the inflammation occurs in the mucosal layer of the skin (and very unnerving, you can actually get lesions in the gut mucosa as well!). In fact, it was my search for a cause (and hopefully cure) for this condition that brought me to Paleo in the first place! All my other health issues either completely resolved or improved substantially within weeks of switching to a Paleo diet, but my lichen planus did not improve. If anything, it got worse. But since Paleo was working so well for me in every other respect, my search for a solution stayed within a Paleo framework. ). Why is it so often left out? I guess it’s because when compared to Lupus, Multiple Sclerosis or Non-Hodgkin’s lymphoma, psoriasis is small potatoes. And let’s just take a moment to appreciate how lucky we are that, when our bodies formed antibodies against our own cells, we only ended up with psoriasis! Psoriasis is also an indicator of a severely leaky gut (that’s how we develop the autoimmunity in the first place), with a very high likelihood of Small Intestinal Bacterial Overgrowth. It is also very commonly linked to a gut-brain connection problem with inflammation and autoimmunity targeting skin cells. I went into some details about the gut-brain connection in this post, but I also recommend listening to the explanation of the gut-brain-skin axis that Chris Kresser gives in his Revolution Health Radio podcast episode titled “Naturally Get Rid Of Acne By Fixing Your Gut”. There is a complex interplay between a leaky gut, a stressed body, loss of insulin and leptin sensitivity, mood issues, food sensitivities, and the inflammation that manifests as psoriasis. Basically, if you suffer psoriasis, chances are your gut, your immune system and your hormones are all really messed up. or coconut milk kefir) every day, and consuming coconut oil every day (I like it in my coffee). So how long until you see some results? You should start to see improvement very quickly, within a couple of days for some people up to 3-4 weeks for others. If you do not see improvement within a month, you may also have developed additional food sensitivities (your gut is leaky, after all). If doing all of the above still isn’t enough to see improvement in your symptoms, it would be worth finding a physician, naturopathic doctor, or chiropractor who will order an IgG and IgA food sensitivity blood test (you might also investigate Small Intestinal Bacterial Overgrowth, internal yeast infections and parasite infections as possible confounding factors as well). These food sensitivities are transient and once your gut has healed (and at least 6 months have passed without exposure), you should be able to reintroduce the foods. Actually, you should be able to reintroduce eggs, nuts and seeds, higher sugar fruits and vegetables and maybe even nightshades at some point in the future as well. Are you wondering how long this is going to take? I’m afraid the answer is anywhere between 2 months and 2 years, depending on exactly what the root causes are for you. But, if you could see how much my lichen planus has improved in 3½ months, you would be amazed. I know that the extra dietary restrictions are tough, but it is worth it to be able to cure such an aggravating condition without the use of steroids. And the thing to keep in mind is that once the psoriasis is gone, out-of-the-box Paleo really will be enough for us. Interesting! Myself and my youngest basically eat this way…and our exzema and other issues went away. NO nuts, and seeds are Ok. I have hopped that if our guts healed enough, we could add nightshades and acid foods back in, but not happening so far. Hi Sarah, Jamie is 3 and is doing well on Paleo (he is sensitive to nightshades , eggs and coconut) . His skin is not improving though , it initially got better but he still get little bumps on his thighs and arms.. He has a lot of almonds and fruit and also sweet potatos.. would you cut these out? I am not sure where to go from here – he LOVES fruit and it would make things super hard. I would try getting rid of the almonds first. They are a common food sensitivity and can cause gut irritation too (also maybe avoid even the occasional rice porridge). Do you have any dairy left in his diet? Bumps can be related to extreme casein sensitivities. Leave fruit and sweet potatoes in his diet for now (poor guy, he’s got to be able to eat something!). See if you can get some bone broth into his diet and make sure he either gets a VitaminD3 supplement or lots of time outside. I would give that a bit of time and then maybe see if you can get a food sensitivity test done before cutting out fruit and sweet potato (if his gut was really leaky before, he might have developed a sensitivity which is slowing down the healing process). Keep me posted on how he’s doing! he definitely doesn’t get dairy as he is severely allergic to it! He does have bone broth at least 3 times a week. Will leave out porridge too. Thank you Sarah, it’s a minefield this !!! oh and he has a vitamin d3 supplement too! I know it’s rough! But after his gut has fully healed, he should be able to eat some of these foods again. Is he getting any probiotics? Good luck! no he’s not, i thought of getting some water kefir grains. He got terribly bloated on probiotic supplements.. Thanks for the info and glad to hear you ps is improved but I sort of feel like: shoot me now. This is rough, as you well know! I have to admit I’m ready to cry….I love sweet potatoes…tomatoes were bad enough to give up, now sweet potatoes? Fruit? I have cut way back on fruit, having strawberries, melons, raspberries. It is just my husband and I, so making bone broth is a challenge. I’m feeling overwhelmed. I know what you write is correct. I know I have a leaky gut and I need to do whatever I can to make it better. I also don’t have a gallbladder and I know that this is a factor…..thanks for letting me vent! Thank you for all that you do! I know it’s rough and I have to admit that I still indulge in foods I know I shouldn’t eat (especially fruit and nuts). But even doing this 75 or 80% will probably show an improvement (and then maybe seeing improvement will give you the motivation to go 100%). US Wellness Meats sells bone broth from grass-fed cows (grasslandbeef.com) if that helps. Are you taking digestive enzymes? I’m not an expert on dealing with life without a gall bladder but I do know that the various Paleo nutritionists out there highly recommend them (maybe try and get in touch with Diane of balancedbites.com). 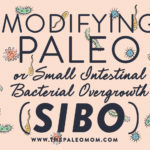 Also, Stacy of Paleoparents.com has been blogging about diet changes she’s making to deal with leaky gut issues with no gall bladder, so that might be helpful for you too. Good luck! I am suffering enough that I’m ready to go 100%. I have been gluten and dairy free at times and know that it makes me feel better. I am not taking digestive enzymes but I know that I should be….I will stop at the Naturopath and get some. Thanks for the info on the bone broth. I will check that out. Also, I have been following Stacy’s post. Again, thank you for taking the time to share and lead on this interesting journey….I just got done putting $200 worth of groceries away…the bummer was my grocery store was out of parsnips, turnips, and butternut squash. ); Hoping to make it to the first farmer’s market of the season this weekend. Should I not be eating any fruit? I picked up some cantaloupe, blueberries, and raspberries. Fruit is okay for most people as long as you aren’t eating a ton at a sitting. Some people cut out fruit altogether for a few weeks and then slowly add it back in, but if you have other things to try first, then don’t worry about it for now. you are amazing! 🙂 thank you so much for sharing. husband was just wanting to take our 2 year old daughter to the “doctors,” which i believe very different. i feel like i can make changes on my own without having the doctor filling me in on the s.a.d! i have her on goat’s milk and goat milk yogurt for her probiotics. goat’s milk products are not cheap ($8 for a half gallon of milk). do you think that’s contributing to the psoriasis too? Tricky with a 2-year old… maybe some homemade sausage or bacon from pastured pork? with some fruit on the side? Definitely the goat milk may be causing a problem. I would switch to coconut milk without any gum ingredients (it’s cheapest to make your own). I have started serving lunch leftovers for Jamie’s breakfast (like roast chicken with a side of veggies plus a banana, or lamb meatballs with some leftover soup and a bit of fruit etc) and this seems to satisfy him well! My psoriasis is worst it has ever been. In fact, I have all the symptoms you mention. I’ve been on “out of the box” Paleo for 8 months. I’m that person that Paleo made worse symptoms for. (Ack!) My skin is much worse. I have psoriasis now in places I don’t even want to type about here. (Ahem.) I gained several pounds. I have tried elimination diets before (no nightshades) and I’ve been off gluten, dairy and soy for about 2 years (even before going Paleo, which now of course means no grains at all). I only do sweet potato once in a while…. once a week maybe. I do eat a lot of eggs. Wondering if that is part of the issue. I eat from 3-6 eggs day sometimes. Biggest obstacle for me is I’m not a tremendous fan of meat. I eat it because I have to. I’d eat veggies all day long, but I just don’t LIKE meat that much, which is probably why I end up eating a fair amount of eggs. I was vegetarian for 15 years. Unfortunately, organ meat is something I can’t approach. I can make bone broth, but I’m not sure it’s something I can do regularly. I’ve gotten to the point, after seeing many practitioners, and trying many different diets, that I feel very overwhelmed AND like I just keep restricting my diet further and further. (Which is tough for me because I have history of eating disorders and the severe restriction is very triggering.) I feel pretty trapped. If you have any links with suggested meal plans or other helpful suggestions, I’d really appreciate it. Thanks! This post was very informative. Eggs was absolutely a trigger for me and I believe the reason why I got worse with Paleo (because I about tippled my egg intake). Do you like fish? That would be the best solution. 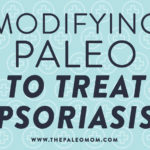 Psoriasis is an autoimmune disease, so if you can handle the restrictions, it would be really telling if you could follow the Autoimmune Protocol https://www.thePaleomom.com/2012/05/modifying-Paleo-for-autoimmune.html for about a month. You should see a difference (I know it’s hard. It’s hard for me and I LOVE meat!). 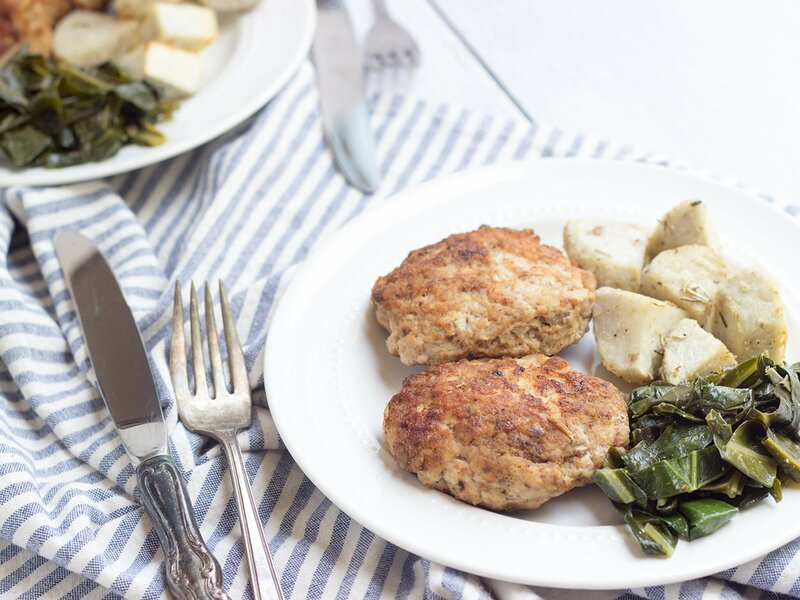 I haven’t put together an AIP mealplan yet, but that’s a great idea! I have psoriasis, but it stared out as eczema when I was little. It was a small white patch on the shin of my left leg. I’ve cut out gluten, dairy, and nightshades from my diet. I mainly try to eat organic fruits and vegetables; rice and sweet potatoes; and lean meats. I also have cut out nuts from my diet. I was diagnosed with an immune deficiency and was on IGG treatment for awhile. However, it seemed to make my psoriasis worse. I used to use steroidal creams, but obviously now I know how damaging they are to my health. I’ve been slowly trying to rebuild my immune system, but I feel as if my psoriasis is very stagnant. Certain things help my psoriasis like: dead sea salt baths, curcumin, vitamin D3, evening primrose oil, among other things. I feel as if I’m always walking a tight-rope trying to make it go away. Any suggestions? I’m not sure if I should focus on my immune system, leaky gut, or removing toxins from my body. It’s as if I have cut everything out of my diet to hit a wall. Eggs were the same for me. I was curing myself on my own with veggies but everyone told me to eat eggs for protein. I did and I never even suspected that’s what turned my life into a nightmare. I was lucky enough to figure out milk and gluten on my own through much trial and error but eggs threw me off. Hello, I am gennone from Italy, sorry for my bad English, I’ll try to make me understand the same.I follow the Paleo already for 8 months. My psoriasis has been reduced by at least 50% but I am a vicious man, and I still can not quit smoking..sometimes I drink good red wine and I eat pork meat..
Luckily I’ve found scottish highland fed grass(the best fed grass in the world), but you think might be a problem eating it every day? With all these restrictions do not know what to eat and I am very worried because I’m losing weight. A mealplan for psoriasis or autoimmune in general is real a great idea!! congratulation for your blog. I also forgot to tell you what do you think about garlic as bactericidal.Every morning I swallow without chewing a clove of garlic instead of using grapefruit seed extract, while in the evening I take probiotics with..
Hi Gennone! If you are still seeing improvement in your psoriasis, then that means you don’t really need to change anything. However, if the improvement slows or stops, I think that quitting smoking is definitely something to strongly consider! Organic pork (especially lean cuts) and grass-fed meat are great. Chocolate can be high in phytic acid, which is a gut irritant and can be a problem for many people, especially those with psoriasis. Chestnuts are actually fairly low in phytic acid and in omega-6 fats, so I think they are fine. Garlic is very good for you and I think eating some every day is great! I hope this answers your questions! Hello Sarah, I’m seeing improvements, but the psoriasis always come back out again, so I think something is wrong. Surely wine and tobacco does not help .. the problem is that often I don’t know what to eat, especially at breakfast .. you tips to eat organic meat at least 2 times a week, but I eat it every day, sometimes alternating with fish..I try to follow the advice of Dr. Terry Walhs and eat plenty of vegetables, but the morning i don’t know what to eat(I have seen too much fruit that makes me itch)..
Can I eat fedgrass every day in your opinion? Can I use good quality whey powder protein? My big problem is that I’m losing weight and I am very underweight..
Hi Gennone, I don’t see any problem with eating grass-fed meat every day (or even twice a day!). I typically eat homemade sausage (either grass-fed beef or pastured pork) with fruit and vegetables every morning for breakfast. Fish is wonderful too and you can eat as much fish as you want. You can try a good quality whey protein powder. It may help you to gain some weight (but keep an eye out for increased symptoms). Quitting smoking will probably help you gain weight too. I hope this helps! I am going to attempt an experiment with Ghee. You said even grass fed butter and ghee. Why do you say that and what has your experience been with that? From a google search it seems that ghee is a popular treatment of psoriasis in India. From my research going Paleo means switching energy from sugar sources (carbs, starches) to fat sources (grass fed wild(because of the higher omega 3 content)). Makes sense because fat is vital to fat soluble vitamins that protect omega 3 among many other functions. Ghee is a great thing to experiment with. Many people who are sensitive to dairy can handle ghee because the protein content is so low. The fat from grass-fed ghee is beneficial because it’s high in conjugated linoleic acid (CLA), which can promote healing as well as having a good balance between omega-3 and omega-6. But, there are many people who are so sensitive to the proteins in dairy (casein, casomorphin, butyrophillin) and even the trace amount in ghee can cause them problems. Psoriasis is an autoimmune condition and is associated with a leaky gut, which is a good indication that most people with psoriasis are probably super sensitive to dairy. That being said, ghee and pastured egg yolks are tied for potentially beneficial food worth trying to add back in and see if you can tolerate them. You can also get CLA from grass-fed meat. I have a severe case of psoriatic spondylitis that has attacked my joints, tendons, and ligaments throughout my body, and even my eyes. I was reduced to living on disability within 3 years. I am also pre-diabetic, and developed life-threatening adrenal insufficiency due to long-term steroid use. I started the AIP on July 1st, and noticed quite a bit of improvement fairly soon. I’ve actually been able to start some easy dancing and going on walks – for the first time in years! But I’m having problems trying to find the best version of this diet for me. My doctors and I are having me tapering down on my steroids yet again in an effort to get my pituitary and adrenal glands to start working again. But as soon as I started the AIP Paleo diet, I developed major low-cortisol symptoms – which I believe is from switching to a much lower carb diet (about 60-80 gm/day). This issue could become worse as I continue to very slowly taper my steroids. I read that the body needs to use cortisol to handle a low-carb diet – and my body can’t produce what might be needed. Also, I’ve noticed that my body can’t handle many types of fruit – my blood sugars go up to 160-180 an hour after eating them. On top of that, my blood sugar levels shoot up nearly 50 points after taking my daily steroids (even just 4 mg), even if I’m fasting! My endocrinologist wants me to go back to eating more complex carbs, especially whole grains! But I’m feeling so much better NOT eating grains (except for my blood sugar) – I really don’t want to go back to that. And one suggested beneficial diet for spondylitis involves eating NO starch. Small amounts of simple sugars are OK, though. I feel stuck between a rock and a hard place. No starch is best for my spondylitis; no fruit or sugar is best for my blood sugar; and MORE carbs is best for my adrenal insufficiency! And none of my doctors are really into “weird” diets for dealing with my health issues. I’m not sure how to handle this conundrum, but I don’t want to give up the improvements I’ve achieved so far! Any suggestions? Wow! That is tough. So, my first thought is that finding a way to increase your carb intake a little is likely to help. Not everyone on the autoimmune protocol needs to steer clear of starchy vegetables; it really depends on whether or not you have SIBO, where it is, how much you eat… What I think would be good to try is some of the moderate level starchy vegetables like winter squashes, jicama, rutabaga, carrots, and beets. These are typically okay for SIBO but will give you more carbohydrates without the glucose rush that fruit gives. Maybe try and eat something like these at each meal in addition to green veggies. If you are already eating these and need more, you could try small doses of parsnips, sweet potato, plantain and taro root, which have even more starch. Go slow and pull back as soon as you aren’t feeling well. Let me know how this works! Thanks for the suggestions, Sarah! I’m fortunate, in that I don’t think I have any significant SIBO issues. My chronic intestinal issues cleared up about 1 week after I started the AIP Paleo diet. I went a whole month with no problems there! I was already eating carrots & beets every day, and about 4 servings of fruit. I’ve experimented with eating half a sweet potato a day, without any noticeable problems so far, thank goodness. I think I’d like to try some plantain, too, if I can find some. Then I broke down and ate some caramel candies during a stressful very long drive this week. VERY bad decision! I paid for that indiscretion with 2 days of severe diarrhea. Of course, I’m not sure if it was the dairy components of the candy, or the corn syrup, or something else. Won’t do that again! Fortunately, it didn’t take long to straighten out. Your docs are not into the weird diets bc they are not educated in nutrition and natural health. I found the same problem. That is why I took matters in my own hands, read some books and read websiteS like these. I also started going to a naturopath doctor. It’s been so much better. I will never go to another type doctor again unless I break a bone or something. Ok, ok, this is the post I needed to read! Still worried about training for triathlons. They are only sprint triathlons so not as stressful on the body. But I have allot to learn here. hmmm. I have suffered from scalp psoriasis for about 20 years. The only time over the years my psoriasis cleared were during my pregnancys. Do you know why that might be? I have been doing Paleo for about 6 months and I think I am going to cut out everything you recommend. I feel awesome, but the psoriasis is not going anywhere. I really want to fix it the natural way. Thanks for the great info! Ps. I went to the dermatologist today and he prescribed me a medicated shampoo and a steroid. I asked him about changing the diet because it is a auto immune disorder, but he said it is not autoimmune disorder. He said it is a extreme case of dandruff. Is he nuts? I do not want to use a bunch of chemicals! It is autoimmune, but this is fairly recent information. Steroids may help the pain/itching and help clear it up some if it’s really bad (and you could apply topical steroids in conjunction with diet). I do sometimes resort to using steroids on my lichen planus lesions. I don’t know if I would use a medicated shampoo though. I have mild scalp psoriasis and found that giving up shampoo completely helped me tremendously. Many women experience relief and even full remission of their autoimmune diseases during pregnancy. This happens because of the shift in the maternal immune system that takes place so that it doesn’t attack the baby. Unfortunately, women will often also experience a flare either when the baby is born or when the baby weans. Skin conditions can be one of the most frustrating conditions to clear up with the autoimmune protocol, but it is definitely worth a try (especially giving up nightshades). Good luck and feel free to comment or email if you have any further questions. Yes, thank you so much for the info.! My hubby and I have gotten “rashes” on our faces that have steadily gotten worse since going Paleo and I felt I had just about exhausted all possible options to treat it. I will now be trying the autoimmune protocol for Paleo and see if it works. I hate using steroid cream on my face twice a day but if I don’t the rash gets painful and itchy and spreads. I will try altering my diet before seeing a dermatologist now. Thanks again! You may have to continue using cream for a while, but hopefully can wean yourself off. Good luck! So glad I found this!!!! I went Paleo on 1st August 2012 after being vegan and ill, no energy, thyroid symptoms, vit deficiencies etc… Bedridden….weight gain, even though I was sugar free and gluten free for years! I have now got my lean buff body back!! Have lots of energy and my muscles work!! Yay I can feel muscles! I don’t get breathless and cold any more too!! I broke out in Psoriasis on my scalp and ears. It’s quite horrible. So I am glad I found your page!!! I had been eating almond butter on apple slices, sweet potatoes, , sugar free meringues, and I was cooking everything in coconut oil. I found out I have an allergy to coconut. Can’t even rub the oil on my skin!! Love eggs as they are so quick! It seemed like: I look fit, great weight loss, have my energy back, but at a price of having inflamed skin scalp????!!.. I NEVER want to go back to eating bucket loads brown rice & quinoa, never want that chubby carb look again!! But I don’t want psoriasis either!!!! Before I found your page I was dredding; oh god, do I have to have a carby brown rice diet to heal my skin?!!! But please god no! I want to be thin AND have clear skin!!! So I am going to follow your suggestions and see what happens!!!! On a funny note; Whey protein hadn’t upset my skin at all!! In fact when I take whey, I get such a boost!! Ps- wish we had as much grass fed following in UK as you do in the States!! It’s slowly catching on…! Love your blog. Has tons of useful information about eating Paleo and psoriasis. I have a question about your macro-nutrient ratios you eat on a daily basis. Basically….what are they? Protein 15% – Mix of different high fat meat, (oily fish, beef, pig, etc). If the meat isn’t high fat they add lots of fat to even out the calories. Oils recommended as all low omega 6, (olive, coconut, palm, etc). I just started the diet this week and still consume waaaay to much alcohol on weekends =) So I can’t say whether or not the diet will cure my psoriasis. I have noticed one thing while on this diet however, I am a little shaky/hungry and slightly more irritable at certain times than before. I wonder if this could actually be a good thing…like if it had to do with the die off of some organisms within my body. Did you notice any symptoms as you switched to a Paleo diet? Also, if you can’t eat starch, and you can’t eat much fruit, where do you get your carbs from? From what I understand, carbs that are in veggies get turned into fat when they enter our gut. Cheers and congrats on living psoriasis free! I’m not entirely sure what my macronutrient ratio is, but I guess it would be closer to 30-30-40 protein-carbs-fat. Or maybe 25-25-50. I eat a little fruit and large portions of non-starchy vegetables. I’ve never heard that non starchy veggies get turned into fat and I’m not sure what the mechanism for that would be. If you are feeling a bit shaky, it might be that your body is still becoming fat adapted. That transition can take 2-4 weeks. I came from a low carb diet, so I didn’t have any negative adjustment period symptoms. Mostly I noticed improved digestion and energy in those early days. Hi, Really impressed with your blog, and this psoriasis post. I follow Paleo, and have question about psoriasis. Can I eat of grass fed beef ? ( 100% grass – local farm source ) My main food would be beef and coconut oil. + organic vegetables. I have no problems go with low carb anyway. I choose avoiding alcohol completely. Although my psoriasis started at the age of 10 when I did not drink at all, recently I quit alcohol and gluten and psoriasis completely disappeared. Very important note on the vitamin D, not just for psoriasis but for all autoimmune diseases. Thanks, just a question. There’s a lot of how much vitamin D should be taken. What is your opinion ? sunbed 2 x week 5 minutes. I believe this is superior to oral supplement. I would suggest having your levels checked then tinkering with your vitamin D3 dose to get your levels to the top of the normal range (around 50-60 ng/ML). Exactly how much you need to supplement with will depend on the food you eat, how much sun exposure you get, how efficiently your body makes vitamin D in response to the sun (evidence is that those with excessive inflammation do not convert cholesterol to vitamin D very efficiently), how good your digestion is, etc. There is nothing here that I can recognize as identifying D3. Vitamin D3 is also called cholecalciferol. I don’t think it would be included in any of those panels/tests. I know there are a lot of things we need to eliminate from our Paleo diets such as nuts, sweet potatoes, nightshades, eggs, ect to help clear up the psoriasis. So what do your typical meals look like? Any meal suggestions would be great! I need to take this route as my psoriasis only improved slightly on Paleo. My breakfasts typically consist of any combination of leftovers, homemade sausage, pastured bacon, broth, soups, and fruit. My lunches typically involve leftover meat or canned fish with a large pile of veggies or salad and typically broth if I didn’t have it at breakfast (I usually have one cup of broth per day, but I do sometimes skip a day). I would often also have a little fruit for lunch. Supper is meat with a couple of different veggies and sometimes more fruit. I try not to snack, but if I really need something, I eat homemade jerky, a can of sardines, broth or a spoon of coconut oil (sometimes I eat fruit, but that usually doesn’t satiate me very well). I season with salt and herbs mostly. I drink a fair amount of tea (mostly herbal, but some black and green tea too). I eat fish 5-8 times per week (between lunch and supper) and eat organ meat 3-8 times per week. I follow the Autoimmune Protocol for about a month. Raw and steamed veggies expect nightshades. No grains, legumes, dairy (even no ghee butter), no eggs, no nuts and seeds. Small amount of fruits 2-3 days/week) (~50-200 g/day) (Mostly melon honeydew, grapefruit, pineapple, avocado, berries) Rarely banana or apple. Fats : mostly cocoa butter (20-40/ almost every day and coconut oil 20-40/ almost every day and salted pork backfat ~30-50g 3-5 days/week (RAW), olive or avocado oil, Small amounts of flax seed oil (4-10g/day). I also use coconut milk and desiccated coconut meat (not sweetened) 1-2 times a week. I don’t use sugar, honey or any other sweeteners. Interesting. I do have some ideas. Did your psoriasis come back at the same time that the weather got cooler? Psoriasis and other skin conditions are very sensitive to vitamin D levels and sun exposure. You could get your levels checked and get a recommendation for a supplement dose (you should be aiming to be at the high end of the normal range). There’s no good reason to be taking flaxseed oil. Even though it’s high in ALA, it’s also high in omega-6 polyunsaturated fats. Cocoa butter might be causing a food sensitivity-type reaction since chocolate is a gluten cross-reactor. Are you eating about the same amount of non-starchy vegetables now as you were when following a vegan diet? You might be skimping on some antioxidants if your intake has decreased too much. Also, what about other lifestyle factors? stress? sleep? those are just as important as diet. Thank you so much for your pompt replay. Both of you 😉 I’m realy touched. Yes, Sarah,you are right, my PSO came back at the same time that the weather got cooler. We had even 20 below zero 3-4 weeks ago. Now we have 2-10 below zero. I ordered vitamin D3 (5000 IU per Softgel). They recommend to take 1 capsule a day. Is it enough? Ok, i’ll also quit eating cocoa butter. I’m not sure, but i feel that it can be a big trigger. One more thing – i bought a half of pig month ago and eat pork every day. (Ground,= skin, fat, muscle; salted backfat) This pig was quite big so very fatty 🙂 and i think it’s high in omega-6 polyunsaturated fats. Regarding flax seed oil it’s high in Omega 3, not Omega6. It’s realy hard to eat the same amount of non-starchy vegetables now because of winter and I’m not big fan of imported veggies, so i eat mostly cucumbers, carrots and beets from my garden, cabbage (also homemade sauerkraut), lettuce “Iceberg”, chinese cabbage, frozen broccoli, frozen spinach, frozen cauliflower. Frozen parsley and dill from my own garden. It’s easiest to figure out Vit. D dose if you get tested, but you could also start with 1 per day for a few weeks and see how you feel, then try 2 (it would be highly unusual to need 3 so if you think you do, definitely get your levels tested first). Take it in the first half of the day, better with a meal. I think the other parts of your plan sound great. You can also try coconut oil as a moisturizer which might help. So now I have altered the Paleo diet to my individual body specifications: No red meat or eggs, inc organ meats espesh, as they have the HIGHEST amount of Arachidonic acid in them and Purines! No nightshades! Not keen on nuts either! Gut health is VERY important for Psoriasis too!! Good gut bacteria is needed!!! Aloe Vera gel is very soothing too. Meats I have are: Organic Chicken and wild caught fish- I also take high dose Omega3 fish oil- as people with inflammatory markers need to get extra Omega 3 as it is ANTI-inflammitory! But avoid omega 6!!! Or maybe it really just IS the fact that meat from animals that were fed grains is high in Omega6 (pro-inflammitory and pro AA) that would NOT be there, if they were all grass fed like nature designed!!!! I had definately made a mistake with my fish when I first started Paleo!! Now that I know about AA and incorrect omega6 levels, it is only wild caught fish!!! Even so, any red meat was wild shot, but it still made my body inflammatory…If that is due to my gut not being able to handle red meat ( no matter how many digestive enzymes I take or bacteria I take), or even though it is not farmed- meat has naturally high AA levels, who knows!!!!! OR maybe it was mainly the eggs!! And if I had have avoided the eggs I would be ok?!! ( as I was allergic to eggs as a kid). When I was vegan, I could not eat legumes, as they would give me muscle pain and paralyse my muscles!! I have also been taking high dose Vit D for ages! But one thing I learnt for myself: Simply listen to your body!! Instead of trying to follow a diet style like it is a religion, just listen to your body!! I am grateful though for the way I got muscle usage back and energy!! Apple Cider Vinegar (RAW & Organic ONLY) has been very helpful to my skin too! It is said to alkalinise the blood and kill bad bacteria!! (if you try it, dilute it to take internally, it is strong stuff)! My skin is clearing now though, not chancing the eggs or red meat again!!! Sounds like a good plan! Keep me posted on your progress! I gave ACV (raw) a go over christmas, I put it in the vitamix with water, basil, garlic, lemon, and oregano, made a green liquid!!! It tasted DIVINE!!! It made me feel a bit drunk! lol It was so yummy. I went mad dipping buckwheat seed crackers into it every night (buckwheat seed only). I saw a slight improvement, I guess it really alkalised my blood, but its not kind to ones mouth!! It bunged up my digestive system, dont know why….Some ppl say it can be constipating…And the worst thing was that all those buckwheat seed crackers (even though they were only buckwheat (or kasha in usa) seed, nothing else, made me gain some weight. I checked the carb info, and buckwheat seed is higher carb than veggies!!!! Damn those carbs!! LOL ! Just before Christmas I was 8.4st, then in Jan I was 9st ! Booo! Those buckwheat seeds must have disrupted my Ketosis. 🙁 Oh well, I have started to create ketosis again, please god I aim to get down to 8st ! Still, its much better than when I was a vegan, at 10st I just didnt feel like me!!! I lost a whole stone in 1 month after going Paleo low carb on 1st August 2012! I won’t really bother with the ACV again though….Fish is much better for me! And I just dont like anything that gives off that drunk vibe, or may be addictive.. As I do not drink alcohol at all!!! I just saw this page….after my SO got home from the grocery store with loads of fruits, more nuts and sweet potatoes. Just before the holidays I eliminated dairy, sugar and grain from my diet; well, not entirely eliminated yet, but drastically cut back. I decided to change to address my recurrent, debilitating sinusitis and pesky psoriasis that arrived when I spiked a high fever during a respiratory infection as I was going through menopause. Actually, the sinusitis is also an allergic reaction to my 19 year old cat, and I’m stuck with that until she decided to advance to her second life, but she’s got it really good, so I think she’ll stick around awhile. Anyway, my psoriasis got worse after the dietary change and, thanks to this article, I know why! I started eating one egg every day, snacking on nuts and dried cherries and added sweet potatoes to my diet, as my only starch. So, I’ll separate the eggs and stick to the yolks only, find another snack (?) and skip the sweet potatoes, which is fine with me because I really didn’t care for the sweetness. By the way, you inspired me to start a food blog which I’m sharing with my friends and family. I did my first post last week and linked to your article on The Health Benefits of Bone Broth. Thank you for contributing to not only my health, but that of my friends and family! Oh, hecky darn, I forgot to ask my question! I was taking Evening Primrose Oil for my breast tenderness and pain, and it worked great. Then I read somewhere that EPO is high in Omega-6 so I stopped taking it more than once/week. I take 4 1000mg capsules of high quality Fish Oil daily and would like some direction on how much more FO I should/could take to completely counteract the O6 in the EPO. Can you assist with that? Also, just read your chocolate article…..ugh. I used to laughingly call it Vitamin Ch, now I’ve almost eliminated it, but I’d mourn the loss of it too if I have to take it that far. I am confused. I have been to 2 Rheumatologists and the first one wanted to put me on methotrexate (low dose chemo)…I was scared to take this drug so I went for a 2nd opinion. The second doctor prescribed a anti inflammatory drug. Some background…I have had psoriasis on my scalp for about 8 years, I had Iritis for the 3rd time which sent me to an eye specialist who referred me to my 1st rheumatologist. The 2nd doctor I went to I asked if I could please try a Paleo diet before being put on medication. She said it couldn’t hurt but still prescribed the anti inflammatory. I am confused because each doctor I see says something different and I would love to have this AIP work for me. I love eggs but it seems I cannot eat them anymore. I love dairy too and will miss those two things the most but if I can help my inflammation with my diet I will try it. It worries me that every doctor just wants to put me on drugs. I would like to find a more natural approach and the reason I became inflamed. Thank you for your wonderful site. I am not good at dieting and I know it won’t be easy. Doctors receive extremely little (and depending on the program, sometimes none) nutrition education in their training, so it’s just not something that most doctors know about, unless they have a personal interest. The biggest hope that i have for my book is that it will help doctors feel more comfortable with a diet and lifestyle approach before medication. Hi! So happy I found this post and as I read the post above from Tammy, I wanted to share that my daughter, who is 7 seven, was diagnosed a year ago with an AID called superficial morphea and as someone also above mentioned, theres a risk of it attaching to organs etc. She is on low dose methotrexate and has been for a year. She’s being treated by the Seattle Children’s hospital. These doctor’s looked at me strangely when I started making suggestions to her diet and talking about Functional Medicine etc…let’s just say I felt just like that mother in the article, “The Boy with a Thorn in His Joint’s” by the NYS recently. I burst in tears when I read the article because doctor’s are quick to quite our intuition about our own child. She has been living with her dad (in Alaska) an moving back home with me (in NYC)…Yay!. I’m a holistic nutritionist and she grew up eating very clean as a baby – at the time I was raw vegan and her diet consisted of mostly fruits, vegetables, avocados and coconut. When the relationship ended and she lived between 2 homes because of our schedules, she adopted a standard american diet. I’ve been teaching and giving food demos for a while and I love where it has lead me (here too 🙂 One of the oncology practices I would give classes at suggested I’d call Dr. Mark Hyman’s office (because it’s what they new), I did and just the phone consultation sent me to a different path. Long story short, I’m no longer raw vegan although I offer a lot of classes with a mind for Paleo and food triggers. I will say your blog has been the first place that I feel supports this feeling and confirms all the research that I’ve done. Your information is SPOT on. When they say incurable, nice to think it’s “curable from within” 🙂 She’s back with me full time in May and would love to stay in touch with you. I’d love to follow your protocol on her (us!) If you don’t mind I’ll use the email above? Any suggestions for someone who doesn’t eat much meat and would like to follow this diet? I eat fish or chicken maybe once a week and red meat about once every six months. I enjoy not eating too much fish/poultry/red meat because it makes me sluggish and constipated. Thanks! Your articles are the best I’ve read on Paleo diet, autoimmune disease and psoriasis. Thanks so much for a thorough explination that is easy to understand, but not dumbed down. I’m truly grateful. Now, THAT would be a great quote to have on the cover of my book! 🙂 THANK YOU! Autoimmune protocol is a great place to start. I don’t have any recommendations specific to the high eye pressure or glaucoma though. Make sure your Ophthamology surgeon confirms you don’t have acute angle glaucoma. This form can suddenly progress to extreme pain and blindness. This is great information! Two questions: Is the AIP meant to be a lifelong lifestyle or just temporary to heal the gut? And if my dermatitis improved (but did not entirely go away) while I did the Whole30 recently and ate more eggs than I have eaten in my life, is that a good indication that I am okay with eggs? Thanks for sharing all this wonderful info! For some people it is lifelong, for some people it takes a month and they can maintain with standard Paleo. Yes, you are probably okay with eggs, but keep them in mind if your dermatitis persists. You can always try a few weeks without them and see if it gets even better. Just a one thing. I remember a year ago I had much less psoriasis, and the one thing was different – eating fish. I used to eat about 300g of fish daily. I did it again for 2 weeks ( about 300- 400 g daily ) and starting see improvements. Before this I was taking fish oil, but it looks it wasn’t enough. The first difference was nails – anyone with psoriasis knows how easy is to spot it – some of them are completely clear now. You may give it a try ! I love your blog — the science, and your unique voice, make these difficult topics easier to take in. I did want to mention a couple of things, as a lifelong psoriatic and one of the few people to be born with active psoriasis plaques. First, psoriasis as autoimmune disease is not new. I learned about it almost 20 years ago, but I recognize that I also had the benefit of top MDs/PhDs who were working actively in both clinical and basic research spheres. I have found that many alternative practitioners — I recently interviewed two NDs, for example, for my daughter — continue to be ignorant about this commonly known fact. I am thrilled to see you speak the truth about immune functioning and psoriasis. Second, to my knowledge, leaky gut is not the only cause. I would love to see the science that says this is so. I am not saying that cleaning up one’s diet and addressing gut issues won’t help, because I think it can, but the disease is more complex than leaky gut syndrome. I have met psoriatics on various autoimmune protocols, including Paleo, who are frustrated when they flare and continue to remove food… It can become dangerous. It is a highly individualized disease. My mother had the benefit of being able to introduce foods to a virgin breastfed gut and then watch the responses, so I can tell you that one-size-fits-all food prescriptions don’t always work. There are psoriatics who can have nightshades, eggs, etc. This has been a huge confounding factor in trialing dietary interventions. I am not writing any of this to discount the AIP because I know people who swear by it. I say this more to encourage people to keep food and symptom journals to figure out their immune responses. Third, @fionafey mentioned the AA issue, which I think is valid. Another issue is that if one is sensitive to natural food chemicals, such as salicylates and amines, the meat-based diet and bone broth can be an issue. Autoimmune issues run in my family, and my father is sensitive to amines (as are many due to exposure to MSG). If someone is having trouble with the bone broth and meat, amine sensitivity should be considered. A lot of people are unaware of this intolerance, so I wanted to mention it here in case it benefits someone else. My worst flare that nearly put me in the hospital was caused by strep throat about 3 months post-partum. Strep is a huge trigger for guttate psoriasis. My other major flares have been caused by first period after childbirth and puberty (hormones) — completely unrelated to diet and not preventable, sadly. Other triggers include alcohol (effect varies by type); tobacco and second-hand smoke; sugar and HFCS; bread/pasta/simple carbs; caffeine; fried foods; stress; poor sleep; and winter (low Vit D, not enough sun, and dry air). Response to fish oil is variable, and I think that is related to rancidity (have seen issues at times even with the expensive fermented CLO). Again, I really love your blog and feel that you are bringing hope and healing to many. I wanted to add my voice so those who are doing things “right” with diet and lifestyle don’t blame themselves or go overboard with food removal. Removing too much can also stress your body and contribute to flares. Leaky gut is one part of the picture. Also, as someone who is married to an archaeologist who studies food, the Paleo diet benefits as promulgated are not exactly accurate or supported by what little evidence we have about how people actually ate. However, in this time of food and seed genetic manipulation, industrial farming, SAD food pyramids, etc., I totally get why it works for many and love all the blogs and recipes that help my own family to eat healthier and cleaner. Yes, you are right, what seems to help one person with Psr, doesnt seem to help another! My body is not a fan of eggs, but who knows, say in 10 years time, my body might suddenly like them!! I am ok with nuts (not cashews as they are horribly mouldy toxic, and no “pea”nuts as they are not a nut but a member of the legume family)!….I take a high does of L-Glutamine every day. My body loves FISH too! But I make sure it is wild caught!! I find Chinese Medicine works miracles for me…I have a diff type of Psr, ‘Mixed Connective Tissue’ disease. The joints and tendons, organs are affected, with Lupus like symptoms. I really believe I can heal and be ok. The typical high carb vegetarian/vegan diet recommended for Psr really doesnt suit me at all!! I also use Goat Whey protein powder, found it very helpful! Hopefully grass-fed/wild caught will catch on more here in the UK! I just checked how much fish oil I was taking everyday in the last 2 weeks – about 10 g ! There’s no problem to get grass-fed meat in UK. I shop locally and the beef is amazing. Never read about L-Glutamine helping Psoriasis…. got to read more. Fiona, we have our Paleo UK facebook group. It is closed one, so if you would like to join, I will catch you on fb. I’ve been suffering from psoriasis for more than 10 years. I’ve been introduced to the whole Paleo thing through your podcast and I thank you for that. I’ve already started to implement many changes to my diet to adopt Paleo style, and about to start AIP. I’m glad I found this article before I started AIP because I had no idea it was recommended to remove butter and even sweet potato from the diet. My question is, about coffee and tea. I drink about 2-3 cups of regular coffee everyday. You recommended to remove it completely if possible, and I think I’m going to do that. What are your thoughts on regular tea & decaf coffee? Thanks for your advice. Decaf coffee is still a problem from a gluten cross reactor standpoint. Black tea is a gray area. In moderate quantities, it may help the body recover normal cortisol levels, but in higher quantities, the caffeine can disregulate tea. Black tea may also have some immune stimulating properties, but that’s not as clear (it’s clearer for green tea). So, ideally you wouldn’t drink either, but I do have to admit that I still have several cups of black tea a day. My boyfriend used to have psoriasis on his hand and leg. After normal Paleo (with regrettebly regular badly chosen, often gluten-containing cheats when I’m not around) the psoriasis on his hand went away and he eventually went to a dermatologist for the psoriasis on his leg and they gave him cortisone cream and said he’d have to apply it forever to keep it away. He used it once, it went away and never came back even though he didn’t touch the cortisone cream again. Maybe it needed a jump start or something and the Paleo diet (albeit full of cheats) is keeping it away… No idea. Loved finding your site today. Looking forward to exploring more. One question, though. Have you ever heard of the cilantro cure for psoriasis? Any concerns if I take your advice on diet restrictions but also try to ingest one bunch of cilantro per day? I don’t see any problems with trying both. Let me know how it works! Please look up the effects of cilantro on your heavy metal detoxification, especially if you have mercury amalgam fillings. With that amount of cilantro, you could do a detox that pulls mercury from fillings or recirculates metals throughout your body and brain. I definitely recommend a probiotic and/or fermented foods. Also getting your vitamin D checked and eating lots of glycine-rich foods (bone broth, skin, knuckles, meats with a lot of connective tissue like cheek and chuck roast, organ meat). You may also want to have a look at what you put on your skin. A high saturated fat moisturizer like coconut oil or grass-fed tallow can be very helpful with restoring barrier function. Hi, just saw your page while doing a search for phytic acid and psoriasis. I’ve had guttate and inverse psoriasis since I was 13 after bout of strep throat (a very common starting point for guttate sufferers). I do a similar modified diet I like to call Paleo light 🙂 but its mainly gluten free dairy free and I avoid soybean oil like the plague amoung other things that don’t really fit under a certain diet heading. So it was refreshing to see your out of the box Paleo. Most of my stuff I’ve picked up from medical journals (I’m a scientist too) but have not seen anything reguarding avoiding egg whites. I’m sorry if you covered this already, but why egg whites? Should I avoid the ones from my own chickens? They too are on a soy free diet. I had excema as a kid and dx with psoriasis at 18. Even 30 yrs ago I was told it was AI, but every doc I’ve ever been to has always said “there’s nothing you can do other than use this cream, get some sun, go tanning, etc”. I also have Hashi’s which of course I was just told it was hypothyroidism and to once again, “take this pill”. In July 2010 I was poisoned by Levaquin (an antibiotic) and started learning about SAD and how to maybe change my health. Over the last 2 1/2 yrs I’ve learned what you have written about through trial and error of my own. First removing the garbage (processed foods, HFCS, hydrogenated oils, soy, etc). Then, changing some foods to non-GMO and grass fed meats, etc. I switched to an ND in Jan 2012, and in Feb 2012 I had a 95 food allergy test and found out I was “allergic” to casein and borderline on egg whites. That test gave me the determination I needed to stick with something. I now had it in black & white (well red actually) that dairy & eggs were harmful for me. Within the first couple of months I started noticing some improvements, less gas, better BM, and some improvement in my psoriasis. I added water kefir daily in late April. But, then things plateaued. In researching and learning about Hashi’s, I learned about leaky gut and thought “I have to have that or I wouldn’t have these other problems”. So, after consulting with my doc, we agreed I needed to do a gluten challenge. So, May 1st, I gave up gluten in addition to the dairy & eggs. Yep, no gluten for me. Things started improving again… even lost a few pounds (although I need to loose a LOT more). But, then I started having all these other problems I had never had before; acne around my mouth, cysts on my jawline & chin, my post-nasal drip returned, the worst smelling gas (makes the dog’s seem mild), and my psoriasis would flare. Piece by piece, I realized I can’t have nightshades (although I figured them out one at a time, not as a class). Pork even causes me inflammation. Oh and the fruits & starchy veggies were my gas culprits… I had now lost 10 lbs and was keeping it off. I had more energy and was feeling better. But, why was I not loosing more? At 5′ 2 3/4″ I should weigh 115-138 or so. I feel the best around 106, but would be happy with 118. At the top, I was 189.8 and was hovering right around the 179-180 mark. Something was holding me back. I kept thinking rice might be causing me problems. I didn’t eat it that often, and of course with psoriasis it takes a couple days to see the flare. What else is it?? So, I decided to give GAPS stage 1 a try. Within the first 2 days my swelling went down, I started to loose weight and within a week my psoriasis had made huge improvements. But, after a week and a half, it was my son’s 14th birthday and I also was in a hurry and had take-out pad thai (GF & egg free, the owner is celiac so comfortable with her processes). I made a GF chocolate cake; mostly brown rice flour. Guess what… yep, my psoriasis started to flare again. Confirming I can’t do rice. Oh and ghee!! I thought ghee was OK for me, until I read your blog. Sure enough… it’s a very mild reaction from it, so had I not read your post I would not have suspected it. It’s only been 6 days since I had the pad thai & GF cake, but things are improving again and I’m now down a solid 14 lbs and clothes & jewelry are starting to fit much looser. Since I’ve been off eggs for over a year, I really, really, want some… but I feel like I need the psoriasis to completely clear before trying to add anything back in. Your blog has confirmed for me what I’ve learned through trial and error. I’m OK without the gluten. Grains may be a tad tougher. I like a little rice now and then, but obviously my body doesn’t like it. I love butter so much, I’m sad I won’t be able to use ghee. But, feeling good is SO worth it. So, if I’m understanding your blog correctly, over time, I should be (hopefully!) able to reintroduce most of the foods. However, Gluten & Dairy will never, ever cross these lips again. Oh, nor my skin! Learned about that too… lotions without chemicals nor gluten, going with natural shampoos, conditioners, make-up, toothpaste, etc. I just wanted to share with you and thank you for sharing with all of us!! You are amazing and an inspiration. Keep up the great work and thanks again!! Can you please explain why nuts are no good? I’ve always had skin problems, especially on my arms, but I’ve had one particularly stubborn spot of psoriasis on my right ring finger for about four years. Nothing I’ve tried has worked, so I usually just find ways to soothe it when it flares up, usually either diluted apple cider vinegar, coconut oil, or some nasty topical steroid cream when it gets really bad. My mom linked me to this page a few weeks ago. I already ate really healthy, but I thought I’d weed out a few more things. I’m now on day five of eating like this, and the spot is almost completely gone! I’m amazed at the results, and I’m soo so grateful to have found your website! Aside from my finger being cleared up, I have much more energy, I’ve kicked my sugar addiction, and I’ve lost a little weight! You and your blog are amazing! Thank you so much! Hi Sarah, do you have a page on how/when to reintroduce those items we should be able to tolerate at some point in time? My psoriasis is a lot better, but not great yet. Mostly because I keep having a hard time leaving rice alone. 🙁 Seems like my go to comfort food these days is Pad Thai or Orange Chicken on rice noodles. It’s only once or twice every 2 weeks, but it’s too much and I know I need to leave it alone. But, I’ve been off eggs for over a year. Started eating them in baked goods a couple months ago and think it’s OK. I’d really love to have an egg for breakfast… but I think you’ll probably say I need to be better with no rice/noodles for a month or more before trying to add something. Right?? Thanks so much!! It’s okay in moderation. I would suggest keeping to 1/4 cup or less per day of flakes. Isn’t is wonderful? I saw more improvement on 3 days of AIP, than 1 year of gluten free and 8 months of dairy free, and after 18 years of living with psoriasis I feel incredible. l wish you all the best! Do you want to submit that as a testimonial for my book? Info is on yesterday’s post. Did I read your post correctly? A person can be healed from psoriasis? I didn’t think that was possible. I thought once you had it, you always had it. My husband has psoriasis and we recently started a gluten free diet, which has been helping. He cheated one day on vacation and had a piece of cake and within a half an hour his joints were hurting and swelling. So we know its a start by cutting out gluten. But anyway, my real question is finding out if you really can be healed from psoriasis? Thank you! Yes, you can. It’s called remission. Technically, it can flare again at any time (since once the body learns to attack itself, it never forgets), but with careful diet and lifestyle choices, you can put it into remission indefinitely. Hi, thank you for this great homepage! I have Psoriasis and are already pretty lean (could even be good if I gained some weight) so I am wondering what you recommend to keep my weight or even gain weight? I am a little worried if I stop eating sweet potatoes, where should my carbohydrates come from? Hi, carbohydrates are not essential. From my experience , very low carb, high fat eating works really well ( as addition to autoimmune Paleo ). That was my point of view. To keep weight or gain , the best way is … strength training. More muscles = more weight. I wouldn’t recommend eating more carbs to keep weights, as this would preserve mostly fat tissue. I’m so glad I found this article! I went strict Paleo a year and a half ago, and EVERYTHING got better except my psoriasis. (My eczema disappeared entirely, but my psoriasis was still there.) I’m going to try your recommendations and see what happens. I wonder if part of the problem for me was eggs, since I did start to rely on eggs quite a lot. I was also still eating lots of nuts, a few seeds, and tomatoes. Thank you for your advice! Hi, the last couple of times I’ve eaten a little dark chocolate its made me feel really nauseous & light headed. Do you know if it’s more likely to be the sugar or the cocoa bean? It could be sugar, caffeine or a sensitivity to the cocoa. Do you have a similar reaction when you drink tea/coffee or eat fruit? I’m totally caffeine free because it was giving me headaches so I suppose it could well be the caffeine. I had some palpitations with it, which is a normal caffeine response I think. It was 70% chocolate and I’ve had no similar responses to fruit. Hello, I just read your article and it has some very interesting information. It seems psoriasis is a lot harder to treat than I thought. I’ve had scalp psoriasis since I was 14 (I’m 20 now). After years of drug abuse, smoking and a junky vegetarian diet (pizza, box cereal, pb n j’s….ohhh I shutter just thinking about it haha >.<) I quit smoking, doing any drugs legal or illegal and started following a candida diet. I stumbled upon a site called Healingnaturallybybee.com, I felt like I discovered a prophet of healing. She is very knowledgeable about natural medicine and I learned a tremendous amount from reading her articles. When I read her article on the symptoms of candida overgrowth I felt that my psoriasis was caused directly from candida, so I started her diet for treating candida. The diet was very strict, very low carb (pretty much just eggs, meat and above ground vegetables…no caffeine) and she recommended natural anti-fungals, bone broth, coconut oil, butter/ghee and organ meats. Plus no nightshades since I know that psoriatics don't do well with them. After the first couple weeks of carb withdrawl and detoxing I felt great, full of energy and joy and hope for the first time since childhood. My psoriasis was better than it had ever been, my acne cleared up completely, my brain fog dissipating. I did have a couple slip ups whenever I would go to my mom's house and binge on some nuts, I would break out the next couple days and my psoriasis would come back. After about 5 months of this diet my psoriasis had cleared but I felt that I wasn't getting enough carbs. I was becoming fatigued, I developed dark circles under my eyes, I was always dehydrated no matter how much water I drank, I couldn't think very well and I was skin and bone skinny. So I felt that I needed a new dietary approach as my health was rapidly deteriorating. I came across the PHD (Perfect Health Diet) by Paul and Shou Ching Jaminet while reading some posts on Paleohacks.com. They believe that low carb diets can be dangerous especially over long periods of time as ketosis can put a real strain on your body (as I can attest to) and that good health can be achieved through moderate carb intake and correct macronutrient portioning. So I decided to add in sweet potatoes to my diet at every meal. I immediately felt relieved and had energy again. I could think normally and my dark circles began to disappear but alas my psoriasis came back :(, although my acne did not.I became very frustrated as to how to go about my predicament.When I was at my local health food store I began talking to a store clerk about my psoriasis and she told me to go down 2 doors to see a psychologist and auryvedic medicine practioner who does food allergy testing. He told me to look into the GAPS diet, he said that some people who did the GAPS diet were able to clear their psoriasis. I've since cut out sweet potatoes (sweet potatoes aren't allowed in the GAPS diet) and I'm going to replace them with winter squashes to see how I do. I'm also going to take your advice and cut out eggs/butter/ghee. One thing we all should be concerned with is the intake of protein . excess animal protein causes ammonia production in the body . In 2009 study showed that participants on a high-meat diet excreted twice as much ammonia as those on a low-meat diet. This ammonia increases the pH level of your colon, making it more alkaline. An alkaline colon is the perfect environment for your Candida overgrowth to flourish.link http://www.tandfonline.com/doi/abs/10.1080/01635589709514596#.UfOGYz8dGHQ. And most of us with any gut problems have low stomach acid which i think is the key to this so breaking down animal protein would put extra strain on the liver and kidneys. I have had eczema develop early last year and was prescribed several antibiotics before seeing a skin dermatologist and now have really bad yeast infection causing eczema or psoriasis to develop in new spots . I still cannot get my head around increasing protein to heal the gut . I do think we need to eat less of it as i have cut down my consumption and my condition has calmed down for the moment . I truly believe a plant based diet will be the key to reversing some auto immune diseases with the supplementation of zinc to heal intestinal permeability or leaky gut. Psoriasis/candida fungus is generally toxins not being processed by your liver coming out on your skin and I believe a plant based diet might be the key to reversing this auto immune disease with the supplementation of zinc to heal intestinal permeability or leaky gut. Hi Sarah, Thank you so much for sharing your research and understanding on this site – what would we do without people like you? Your posts regarding your struggles with autoimmune issues make me feel hope and despair at the same time! I, too, am suffering a ‘less severe’ autoimmune response in the form of hives and eczema and have just recently found this is because I have developed a high sensitivity to salicylates in my diet. I’ve been doing ‘strict Paleo’ for 3 weeks now, and noticed an immediate improvement in my general health and digestion. I’m holding your AIP in reserve at the moment, as I am very limited in what veges (and no fruit except pears) that I can eat already, so I’m a bit concerned about removing eggs and sweet potatoes, in particular. Interestingly, I’ve noticed I can tolerate medium salicylate foods if I’m eating Paleo, but had to restrict myself to low salicylate foods on an elimination diet – all I can think is that removing grains has helped my body tolerate more salicylates. I was thinking of sticking with basic Paleo for a while (overlayed with my restricted fruits/veg), hoping that I would see further improvement over time without needing to resort to a very strict version of AIP – what do you think would be a reasonable period of time for this trial, or am I just kidding myself and should leap into AIP? Thanks for all the wonderful advice and great recipes you so willingly share! I think you’re plan is a good one. It makes sense to me to see how far Paleo can get you first. I’d give it a month or two before deciding whether or not you need to try the AIP. Hi your blog is very important to me. Thank you ! I follow the Paleo over 1 year but i can not lose weght and worse i still have my Hashimoto and rosacea. Last week i found here AIP and i started without any diary, nightshades, eggs and nuts mainly. I have some questions about sun exposure and my rosacea. Prescriptians are to avoid Sun and use a very high sun factor. I followed everything the last 10 years but no change. Every year or every 2 i do a corse of antibiotics. I would appriciate if you could advise me about that. I think rosacea is similar to psoriasis and other skin deceases. Most skin conditions actually improve with sun exposure, although there are some that can be made worse. I’m not sure about rosacea, but I have heard from many people who had rosacea disappear with the autoimmune protocol so I definitely recommend that as a place to start (there’s definitely a link between nutrient status, meaning whether you are deficient or have a surplus of any micronutrients in your body, and how your body reacts to the sun too). Happy to have found you. Thanks for the science. I eagerly await the publication of your book. I have HLA-B27+ associated auto-immune issues. First showed @ 10 years ago as psoriasis during 2nd trimester of first pregnancy, with more psoriasis/arthritis/uveitis/hashimotos when my first child weaned (common). Had another bout of uveitis during 2nd trimester of my second pregnancy. Started eliminating foods during that first pregnancy…. I (hooray!) managed to not have a uveitis flare with the birth or weaning of my second child even though it is VERY common, and I credit the diet. The ‘low sugar’ has been a very recent thing, and I’ve been thrilled that the last of my psoriasis is gone. It’s so ‘odd’ and so lovely to not be constantly itchy. 1) I’m planning on implementing the full AIP with hope of improving my hashimotos symptoms: low moods, brain fog, difficulty with sound sleep, and thyroid function – I currently take 62.5 mcg of snythroid daily. Are some people finding improvement of thyroid function with the AIP? It would be lovely to have my thyroid bump up it’s functioning. 2) Is it o.k. to roast beef marrow bones prior to making bone broth with them? I love the smell/taste of poultry broth, but beef marrow broth reminds me of the smell of 3 hour post-mortem rat (huzzah for science). Roasted meat smells yummy, and I’m hoping that roasting the bones first will improve the smell/taste of the broth, but will only do so if it won’t mess with the ‘healthful’ benefits of the broth. 3) What is a ‘normal’ quantity of meat/fish for a meal? Lol! There are probably not that many bloggers out there familiar with *that* smell. Ugh. Yes, people do find that they can decrease their thyroid meds and some even go off completely (usually when they make changes relatively soon after diagnosis). Check out the forum Hashimoto’s 411. Yes, it’s find to roast marrow bones before making broth. You should be getting anywhere between 0.5 and 1g protein per pound bodyweight. For most people that’s somewhere between 4 and 8oz per meal. Interesting Blog! 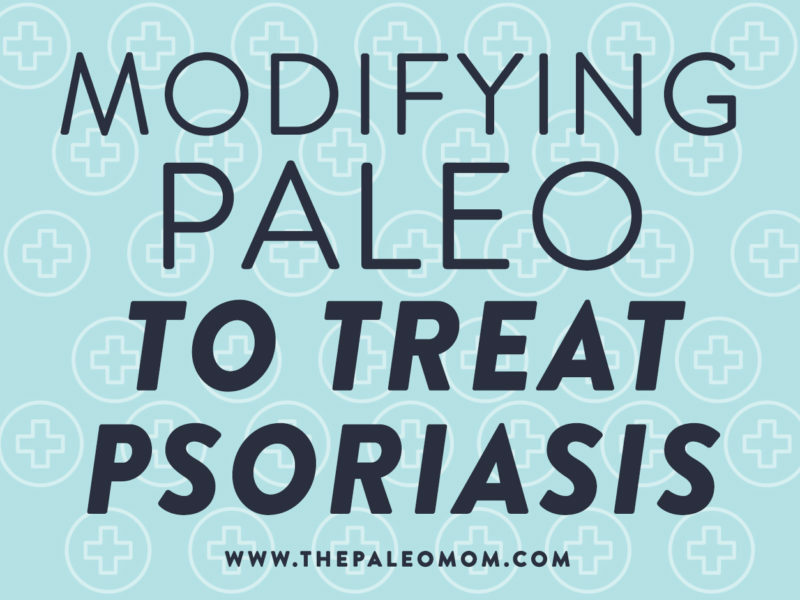 Surely Paleo helps to treat Psoriasis. You Express very well manner about Paleo or Paleo diet those more helps to recover psoriasis. Hi, really impressed with your blog, Great information. Keep up the great work and thanks again. Thanks for sharing your blog. I know this is helpful. One treatment for psoriasis that works for me is dead sea salt. Dead sea salts from San Francisco Salt Company are effective in treating psoriasis and many skin conditions. Soaking in dead sea salts helps your skin feel hydrated and less itchy. See how it works at http://www.sfbsc.com/psoriasis-treatment and save 5% off your first order of Dead Sea Salt with coupon code: skincare5 at checkout. Hope it helps. Amazing all the stories covered here…I thought psoriasis hadn’t a real cure, or so I’ve been always told by medics :(. I’ve psoriasis for 20 years now and I’ve eating Paleowise for 5 months now with occasional weekend cheats (sugar,cereals, dairy) and my psoriasis is worse than ever… I’m interested in doing the AIP but I’ve not very accessible grass fed meet and wild caught fish, what should I do? You can still do AIP even if you can’t get the highest quality foods. Just do the best you can. Farmed fish or canned fish is a great option. With conventional meats, stick to leaner cuts and try and keep chicken to a minimum since it’s pretty high omega-6. Amazed whith all the stories on this blog! !I’ve always thought that psoriasis hadn’t a cure,or so I’ve been told… 🙁 I’v had psoriasis for 20 years now and I’ve been eating Paleowise for 5 months , lots od eggs nuts, and my psoriasis is worse than ever. I’m interested in doing the AIP but I don’t have very accesible grassfed meet and wildcaught fish, what should i do? Hi- I’m a long time reader and I love what you do. Thank you for sharing your experience and offering your help! If someone with SIBO / leaky gut / skin rashes adopts a lifestyle that mostly eliminates these conditions, is it viable to add back tubers, other starchy vegetables and rice, especially if one eats with fermented foods? If the gut is healed, there seems to be reason to believe these foods would be well tolerated, unless the gut flora irreversibly changed in a way that leaves the person prone to overgrowth of some cultures in the gut. Also, have you ever eaten resistant starch as a significant part of your diet? Thanks again and looking forward to hearing your thoughts! It is definitely possible that these foods will be well tolerated in the future (although there are no guarantees). I like green bananas, and eat a fair amount of green plantains and other starches, like kuzu. But, usually I eat green plantains and kuzu cooked, which would reduce the resistant starch, so I don’t know how significant a part of my diet that is. I haven’t noticed any particular benefit or detriment. One question….I’m starting on Monday the AIP and I’m confused about fruit, how much should i eat, how much is 10-20 gr fructose? Hi! Thank you very much for all this information! looking foward to buy your book! I learned I had psoriasis when I was 13 years old. I had asthma until I was 14 and came back a few years ago (I’m 39). I was diagnose with gastroparesis ( lazy stomach) aroun 7 years ago. Lately I developed severe allergies to food ( visit to the ER for natural carrot juice), and allergies to local trees also fibromalgya for almost 10 years. Can I eat bacon? Cook with the fat? Can I eat meat or organs that say “vegeterian diet” or the meat has to say ” no corn feed”? I think the best cooking fats are quality animal fats, like grass-fed tallow, pasture-raised lard, bacon fat from pasture-raised bacon, etc. Palm oil and shortening are okay. Olive oil has a very low smoke point, so it’s only okay for very low temperature cooking. Yes, you can eat bacon-pasture raised is best. Vegetarian diet usually means grains… it’s not the best, but if you’re eating lots of fish, you’ll be able to balance your omega-3 to 6 intake. For the constipation, try digestive enzymes, magnesium supplement, and using a stool when you go potty (like a squatty potty). Skin is the lowest priority organ for your body to heal, so if you’re seeing differences in as little as two weeks, that’s great! you are wonderful! thank you so much for your answer!! I will follow all your advices and I’ll keep reading your site! thank you very much! I’m starting with AIp since I have psoriasis and it’s become worse lately, I can’t get too much sun exposure for the vitamin D (or D·??) but I eat lots of salmon, tuna and so…should I take supplements? how much? The best strategy is to get your vitamin D levels tested. If you’re eating lots of seafood you probably don’t need a supplement, but a test will tell you for sure. I suffer from extreme dandruff, and the last dermatologist I saw about it said that he couldn’t tell me whether it was scalp psoriasis or seborrheic dermatitis, but that it didn’t matter because the treatment for both would be the same (antifungals and steroids). If it’s seborrheic dermatitis, would the autoimmune protocol also help? I’m confused about the difference between these two conditions and whether they would require varied approaches. I’ve also had two babies in the last two years, and after each pregnancy I have experienced a flareup of some kind of rash on my arms and hands that looks like round, scaly coins of various sizes. I’m not sure if this is psoriasis or something else, and I don’t plan to see a dermatologist to get an official diagnosis, but given the post-pregnancy flareup can I assume that this too is autoimmune in nature? Skin conditions are all either autoimmune or immune in nature (well, I guess there are some viral, bacterial and parasite rashes, but that doesn’t sound like what you’re dealing with at all). So, whether immune or autoimmune, either way the autoimmune protocol should help. Also, skin conditions appear to be especially sensitive to sleep deprivation and stress. Glycine-rich foods, vitamin A and D rich foods (bone broth for glycine, organ meat and seafood for both) are especially helpful for healing the skin. I’ve been two weeks on the AIP an my psoriasis is better, less itchy, less plaque…I’m sure it’s improving! I’m intending to get some fish-oil and vitamin D, but I don’t know how much should I take of both…I eat lots of salmon, sardines, tuna and grass-fed meet ocassionally. Any suggestions? What do you think about duck eggs – different enough to be ok, or all the same? They still have lysozyme, but seem to be less allergenic. Some people seem to tolerate them well and some people it just doesn’t matter. First off, I’m a HUGE fan of your website and this post is incredible, thank you!!! I recently developed guttate psoriasis while studying abroad in the UK. I had a bad sore throat a few weeks prior to developing the rash which is what I’m assuming triggered it. But I’m also thinking the lack of sunlight (and maybe decrease in Vitamin D levels?) could have contributed as well. My mom also has a history of psoriasis (although not guttate) so guess I’m also genetically predisposed to it. The rash started as a few red bumps on my stomach and then progressed into bright red dots all over my body (even one on my nose!) I went to the doctor who diagnosed it and gave me a moisturizing cream as well as a topical steroid gel to put on the rash once a day. I don’t like the idea of using a steroid cream but started using it on a section on my arm at first and after a few days of noticeable reduction in that rash I began using it on my entire body. It’s helped significantly but hasn’t gotten the rash to go away completely, just lightened it up a great deal. I’d like to stop using the steroid gel however and target this through diet. Can the same diet be applied to healing guttate psoriasis? I eat a strict Paleo diet that consists of primarily meats, veggies, & fats. I seldom eat fruit or nuts however have been eating nuts more out of convenience when traveling abroad. I don’t eat many starchy veggies except for half a sweet potato post workout. I do however eat tomatoes and peppers nearly everyday – they’re two of my favorite veggies! Eggs I eat probably 4-5 times a week, and I never used to eat butter but have begun cooking with Kerry Gold grass-fed butter since abroad. I’m going back to Denver, Colorado in about three weeks so I’m hoping once I get some more sunlight back into my life my Vitamin D levels will go back up and the psoriasis will start to heal more quickly but I’ve started taking a Vitamin D3 supplement since I got the diagnosis (about 8,000 – 12,000 IU / day). I have also just begun taking a fermented cod liver oil supplement and drinking about 1-2 tablespoons of gelatin (green can from Great Lakes) dissolved in water everyday. These three changes have all been made in the last 2-3 weeks, post development of the rash. Should my next steps be removing nightshades and eggs? Is guttate something that is now in my system forever similar to the other types of psoriasis? Also, is it ok to just stop using the steroid gel altogether? Sorry for the excessive post but I’d really appreciate any feedback you can give me! Yes, but I would urge you to check out the most up-to-date version of this protocol here: https://www.thePaleomom.com/autoimmunity/the-autoimmune-protocol This is much more about elimination (and yes, I think eliminating the butter, nightshades, nuts and eggs is a good idea), but also about increasing nutrient-density. Sleep, managing stress, moderate-intensity activity are all also important. I only recommend supplementing with vitamin D if you’ve had your levels checked and they are low (too much vitamin D can cause problems too). Gelatin and FCLO are great ideas. I recommend talking with your doctor about the best way to stop the steroid gel. Generally, topical steroids are safe to stop cold turkey, but this is still important to ask a healthcare professional first. Also, make sure you’ve got the diet and lifestyle stuff dialed in first. You also might find some relief from natural fat based moisturizers like tallow balm or Green Pasture beauty balm. First of all, you blog has been one of the greatest discovery for me and my personal health. It’s been more than one month in AIP and I’m doing great. My Psoriasis has improved it’s aspect a lot, the patches have not started to disappear but look way better! As Christmas days are coming,and I dont want to look like a social introvert, I’m planning to make some conscius reintroductions to see how my body responds. As I am doing so good, I would like to avoid every food that can cause me harm. If I do an intolerance test, will it show EVERY food I should avoid? Or should I eat those types of food and se how they affect my body?plus I will accelerate the process of knowing which foods I should avodi.I’m planning also to start with some vitamin D supplementatios, as I’ve read many people with psoriasis have experienced hughe benefits. Also, when I make an introduction…how much time does it take to start again the healing process?Thanks for everything!! There are many ways you can be sensitive to foods that won’t show up on tests. You can still do testing to know which foods you for sure shouldn’t reintroduce yet, but I would still recommend cautiously reintroducing one new food every 4-7 days. I would only recommend supplementing with vitamin D if you have been tested and have low levels (although a food based supplement like fermented cod liver oil is very safe because of the other synergistic vitamins in it). If you reintroduce a food that isn’t working for you, you can expect anywhere from a few days to several months to start seeing healing again (since you’re seeing improvement so quickly though, probably not months for you). But I’ve read that blood type tests for food sensitivities and allergies are very accurate. Is there any possibility that I can be affected by foods that aren’t shown in the tests? I’m planning to do a test that combines food allergies and food sensitivities. Allergies are very accurate, there’s a lot of controversy about how accurate food sensitivity tests are… I think this really stems from how dynamic food sensitivities are compared to allergies. They can come and go and when you do a test, you get a measure of just one point in time. Thank you so much for your research. My husband has psoriatic arthritis and for 2 1/2 months has gone gluten, casein and nightshade vegetable-free and is doing fabulous! I know not everyone may do as well but I want to encourage those to try, he’s not even as strict as the AIP and sees HUGE improvements. As physicians ourselves we were skeptical but not anymore! Thanks from the bottoms of our hearts. I was just diagnosed with psoriasis after suspecting it for a couple of years. I notice that you said you were taking 12,000IU of Vit D a day when you wrote this post. Do you think this is still a reasonable target? I live in Connecticut and get hardly any sun, though I will be vacationing in Arizona for a couple of months this winter. My dermatologist recommended 2,000IU a day plus daily sunning, but maybe I should shoot for at least a slightly higher dose. I eat a very restricted Paleo diet and am currently transitioning to strict autoimmune. I don’t take any at all now. I recommend getting your levels tested and working with a healthcare professional to figure out a starting dose, then retest to see how you’re doing. Oh I just read your comment about only supplementing with Vit D if your levels are low…I was tested last summer and was in the 40s I believe. What do you think–should I still supplement with Vit D? I have taken the FCLO/BO blend in the past, but I don’t want take that one because I’m worried about the butter oil…and I didn’t really notice any difference from it. Nope. I would not recommend supplementing if your level is in the 40s. Too much can cause problems too. What worked for me? About 90% of my dermatitis/psoriasis/dandruff/lesions was gone after just 3 days of not eating any RED MEAT. My small plantar wart even disappeared from childhood. Sometimes I eat some quality fish once a week. I love unpasteurized dairy cream, but avoid all store bought dairy such as cheese, yogurt, milk, etc. I don’t eat bread, grains, wheat, pasta, gluten. Generally dairy and grains have a lesser effect on psoriasis compared to RED MEAT. I mostly avoid nightshades except fresh potatoes occassionally. I try and limit my intake of fruit, oils/fats, and legumes. I try and eat mostly raw/grated or lightly cooked vegetables and salads. This may have solved all my problems for a while. But actually I have just taken out some of the most nutritious and body-building foods known to man. Soon the end result will be a weak, shrivelled human being with little energy and vitality. Why do poor kids in India have so much energy, vitality and enjoy beautiful healthy skin after eating only a handful of bread and beans for the day? Why do some people eat red meat, nightshades, dairy, bread without any skin issues? The problem isn’t as much as the food, as it is our LIFESTYLE. We need PLENTY of exercise and sunlight. We need to become so physically tired at the end of the day that we gladly accept peaceful slumber. This is how we stop eating at night because we are so tired, and then our bodies go to work and repair and heal while we sleep. We fast during the night and during springtime we detox with light fresh foods. We eat small meals with lots of variety. During the day we sweat, detoxify, and eliminate wastes from our bodies thanks to exercise. I think moderation in all things healthy like the Japanese eat, tiny portions of everything. I think we are made to eat almost anything. My theory is that we no longer do anything that is natural to our bodies so they just get diseased. Our lifestyles have to change. No more sitting on a chair in the office for 6 hours, imagine what this does to our digestive system, hormones, skin, lungs, etc. We can’t eat bread, meat, and dairy expecting the body to somehow filter out and process these highly rich and nutritious foods, if we do not physically move our bodies and get sunlight everyday. We are designed from nature. If we return to nature and a natural way of living then we won’t even have to think about most of these problems, it just becomes natural to us. We become happy, healthy and complete. I have been Paleo for 2 years now as a 65 YO woman of normal weight and feel great. I had no major health issues when I started and don’t have any now. A year ago, I got patches of what I believe is eczema. I have never had rashes ever in my life so I am puzzled by this. I stopped Kombucha (2 months ago) brewing and drinking because I read that histimine levels could cause this, along with sauerkraut, which I gave up also. Some areas with rash healed, but I still have an angry patch on my hand and now my husband has the same thing on his chest. He eats “kind of” Paleo. What do you think of the nightshade elimination now? This really ticks me off as I eat as clean as I can. I have eaten basically the same salads with peppers and tomatoes for YEARS before this. Eating more eggs, of course now, but little dairy (except Kerrygold). Insight here would be appreciated. Hi! I ordered your book and can’t wait for it to arrive. I suspect my husband has low stomach acid. He developed psoriasis when our oldest son had first asthma attack. Approx. five years later he was effected by psoriatic arthritis in upper back, shoulder, toes and hands. So he’s been on meds for this approx four years. I switched to Paleo diet in last six months and he’s slowly being dragged along. He dropped grains so far and felt immediate relief in hands and shoulder. But minimal change from psoriasis on legs and head. So my question. Could low stomach acid (runs in family) cause leaky gut, which caused proriasis (triggered by stress) which caused psoriatic arthritis? I also believe that his stomach issues now may involve SIBO or IBS. Should he give up dairy and sugar before night shades? I think too much fruit and potatoes and of course double double coffees effects his stomach. Baby steps. Thanks so much for all your information and hard work. 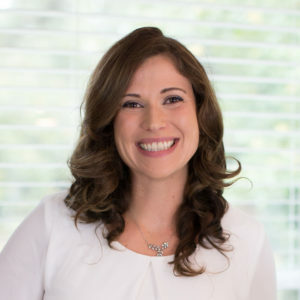 Thank you so much, Sarah, for sharing your knowledge and experiences on Paleo Mom. I struggle with psoriasis as well, and knowing how to modify out-of-the-box Paleo for this issue is really helpful. My husband and I have been on the auto-immune protocol for almost a month, and though we’ve both seen progress, my psoriasis has not improved as I’d hoped, and in fact has flared a bit, as you’ve described it might. Reading your posts on the subject are very informative and encouraging, and this helps me to have the patience to let my body, and specifically, my gut, heal. God bless you, and your family, for your faithfulness to consistently share what you know! I have one question about coffee and green tea for psoriasis sufferers. I’m looking for a stimulant beverage allowed in the AIP, which I’m following. I’m aware that coffee should be limited because of the cross gluten reactivity and because caffeine can rise cortisol levels, which can be harmful also. But for green tea, caffeine is much lower and I’ve read also that it can indeed help to balance autoinmune response in TH1 autoinmune diseases, as psoriasis. Am i right? How much green tea would be too much? Of the record, I’m from Spain and I’ve bought your book. I’m really looking forward to receive it! !YOu’ve made such a great job! congrats!! 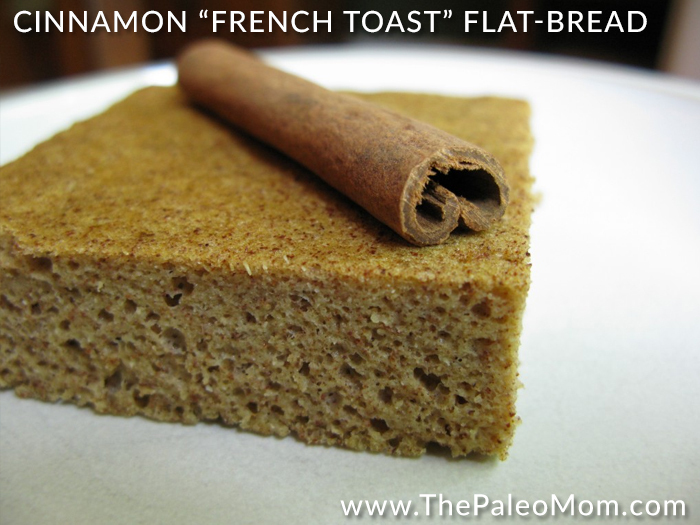 I am just starting out on Paleo, but I’ve drastically cut my wheat intake over the last 4 years. My psoriasis disappears until I slip up. I’m one of the lucky ones, I assume. Thank you for all your hard work. I have a teenage daugther with type 2 diabetes. Your website is beneficial and so easy to follow! I’ll purchase your books when the budget allows! I have had Lichen Sclerosis for over 12 months, and actually it’s been ‘waiting in the wing’s’ for about 10 years I suspect. I have read a lot on your blog about eczema, psoriasis and lichen planus, and wondered if you think Lichen Sclerosis is similarly an auto-immune problem? I am trying Paleo, but not being strict enough, and keep failing. I’ve had intolerance testing which shows up low-range intolerance to Eggs (white and yolk), cashews and coconut. If I heal my gut do you think the intolerances will go? At least then on a Paleo regime I could use eggs and coconut. I have psoriasis and am also underweight. I have a lot of digestive problems. If I limit fruit and starchy veggies as well as all those other things, I’m not sure how I get enough calories. I also suffer from terrible insomnia and eating a lot of meat seems to aggravate that further. I’m don’t quite know what to eat. Any thoughts? I am really hoping for some advice, please bear with me. My father has terrible psoriasis on his hands and feet that is barely kept in check by methyltrexate. Without the chemo drugs, it spreads everywhere fast. It is painful and really interferes with his life. He also has arthritis and carpel tunnel, and now is having teeth and eye issues as a result of 7 years of meds. I really believe that his quality of life would go up significantly if he could heal his gut and eat better (he’s only 50!). They also recently discovered a growth on his thyroid. We don’t yet know what it is. The curve ball is, he and my mom recently divorced. They were married for almost 30 years, and he has never before lived alone until my youngest sister moved out to go to college last fall. He is not an experienced or interested cook. He works a lot of crazy hours at an oil refinery, which I know helps nothing. He has been brainwashed into believing that he needs a low-fat, low-carb diet. I have been slowly chipping away at that. I have given him books that don’t get read. I have even gone and made a bunch of food for the freezer and bought him a slow cooker for Christmas…he still eats Special K with skim milk for breakfast. I would really love some advice on how to approach it with him so that he can easily start to adapt some of the changes into his life style and convince him that this is the way to go. I live almost an hour away, so I can’t take him food every day. But I hate to see him suffering, knowing that I have the knowledge that will likely heal him. Any advice you have would be appreciated. Thanks! Thank you for all your research and study into auto immune disease. I was diagnosed with psoriasis when I was 8 years old…I turn 49 this year. Puberty and my teen years were awful in dealing with it but as I got older it got a little better. While I have used the gamut of steroid creams and had PUVA light treatments and later just went to tanning salons, I fortunately have not had to use any chemo drugs. Now I just use the old over the counter tar based ointment. During pregnancy I had NO patches or lesions at all. In 2010 I had my gall bladder removed and since then my scalp has been in quite a state. I keep things in check with T-Gel shampoo and the tar ointment. I only recently discovered what Paleo is all about and what it can do to help with diseases like psoriasis. My case is definitely genetic in origin but most certainly exacerbated by eating a SAD diet most of my life. I just ordered your book and can hardly wait to get started and see how eating in this way can help. I have also recently been diagnosed with low thyroid function and am trying to manage that with prescription with prescription meds. Looking forward to feeling better soon! Thank you for your passion and hard work! I recently started the AIP diet (4 days now) and am consuming grass-fed beef, bone broths and am trying to find grass fed offal, but that has been hard in Seattle. I started eating chicken liver, but I react to that so I think those chickens were fed some types of grains. A local butcher verified that as well. I am going to the farmers market today but was wondering why my skin has gotten redder and almost created a dry layer on top of the red spots since starting the diet? Is this the skin healing or is it making it worse. Additionally, I eat a lot of food as I used to be a college athlete who consumed 6,000 calories a day. Am I feeding my body too much protein in my meals. It’s usually like 1/4 lb to 1/2 lb of meat/offal in a meal in addition to bone broth and some veggies. I saw noticeable differences when I was consuming just chicken and lettuce for a few days, but was worried that eating too much chicken would cause an overload of omega-6. I was vegan for 1.5 years prior to starting this diet. I have had severe psoriasis for 8 months. I would appreciate any help I can get. Psoriasis has been anything but small potatoes for me. After years of dealing with skin problems from psoriasis, I started having joint pain in my early 20’s. Being so young, Dr’s blew it off. I always had strange symptoms and fatigue – but raising 4 children and working, I kept going. I had viral meningitis at, chronic yeast infections, epstien barr, asthma, pneumonia, toxoplasmosis in my R eye, shingles, uveitis finally alerted Dr’s I had psoriatic arthritis – what I would have given to know this information years ago!! I’ve done well by controlling diet, and hoping this added knowledge will be the final key to complete healing. Very grateful. Just wanted to say that as a person born with psoriasis, I have tried everything out there (expensive creams, ointments, home remedies, etc) in my 35 years on this earth and the only thing that has really helped to completely rid parts of my body affected with psoriasis has been pork fat. It may seem gross and primitive but by rubbing the fat in areas affected by psoriasis, you can manage the condition and actually cure it if you do it on a daily basis. Just give it a try and stop using harmful creams and ointments that contain betamethasone and various corticosteroids. Thanks for all your blogging about Paleo and health issues. Recently diagnosed with psoriatic arthritis (on top of the psoriasis; the psoriasis itself is not pretty but the PA is painful.) Have been doing strict AIP for 4 weeks now — don’t see any change in the psoriasis or the PA pain. How much longer should I be on it before trying something else and/or reintroducing foods? On the one hand, I’d like to give my body a fair shake in healing. On the other hand, it’s demotivating to me to just keep trying the same thing if I’m not seeing results, so wondering how long I should keep in there. Hi, hoping you can clear up some confusion for me. I thought red meat was meant to be a big no-no if you have psoriasis (I think I got this from Pagano?). Are you able to shed any light on this? Many thanks. Can you provide evidence for the leaky gut. My rheumatologist refuses to believe it exists and I need to show them. Can this diet also help with the arthritis associated with psoriasis? I forgot. I had my galbadder removed not too long ago. I was inflamme and the bile infected. Can’t do a lot of fat now either. This has been a great read! I went to my new naturopath and she recommended the autoimmune Paleo diet for me to clear up my psoriasis/leaky gut and also my horrendous keratosis pilaris. Im very saddened by the eggs, and am hoping I can do the yolks, as this past spring we actually got chickens!! This diet is going to be very hard with a 20 month old who is a terrible sleeper (I havent had a full night of sleep in 20 months…), but Im wanting to feel better and lose the bloat that makes me look like Im constantly 5 months pregnant. Oh this article is just what I’ve been looking for! I’ve been a Paleo follower for about two years now, me probably 80/20 and my partner more like 60/40. He has eczema which is just getting worse and I have scalp psoriasis that is worsening too, and in an effort to remove chemicals from my life I’m no longer using traditional shampoos or prescription medication for it. We’re both half way through our third Whole 30, thinking it would help, and it appears to be getting worse. This article explains some of why that might be. My acne is improving though. I’m also interested in supplements. I’ve never taken them for years as I felt I should be getting what I need from my food. Naive possibly! We live in Scotland and our winter daylight is very limited. I’m assuming a Vit D supplement would be wise? My only concern is how to know we’re getting a good quality one. What other supplements would you recommend and are there any good brands? Thanks for your help. Feel a bit despondent about it all! Hi Sarah, sorry for the long comment but I’m at the end of my wits, I hope you can find the time to reply. You have been the one thing I’ve consistently clung to since starting the AIP for psoriasis. I was fed up with my refractory skin (got better in the Summer, always worse afterwards even with UV therapy/ isotretinoin) so I got your book, took a deep breath and started the AIP diet 7 days. I’m not a horrible cook and now bereft of food I love for but at least I have your recipes and knowledge as a foundation, thank you for that. I hope you can help me find out what I’m doing wrong, though I’m not hopeful that these comments are still being read after all this time. At any rate, I’ve followed your recommendations religiously but two days into it I flared up horribly and it hasn’t gotten better yet. In fact, and for the first time in my life, I had a lesion right outside my eye that popped out of nowhere (as they do). Lesions still look horribly pink and skin is painful, especially on my hands and knees, and my hands and lower leg lesions are coalescing at a frightening rate. Scalp very itchy and scaly too, far more than usual. I can’t fathom what is triggering this. I’d already given up gluten and started using coconut oil months ago. I don’t eat any of the forbidden foods, restrict fruit (eat mostly banana and berries as ice-cream) and have also cut out starches + fermented food, like you suggest, and my beloved ghee too. As per Dr. Kresser’s recommendation I just started taking Lauricidin, Prescript-Assist and enzymes for the biofilm (all post-flare and the other supplements I take I have been taking for a long time too), started the no-shampoo, drink rooibos tea instead of coffee, put broth/stock in everything and eat organ meat every day. I might wonder about the red meat (I ate only organic chicken and fish for over a decade) but I’ve actually been eating it since the beginning of September (with barely any poultry since then) with no ill effects. The beef organ meat is a new thing, though, but I’m not eating anything I’ve never eaten before, I’ve always been a big fan of organ meat and regularly ate chicken gizzards and liver (my absolute favourite). I became nauseated when I drank the bone stock for the first time but I’d forgotten to remove the fat and I’ve been adding it to food daily with no problems. I can’t find a natural practitioner here – or even a regular one that believes in leaky gut et al. – so I’m not sure how to further troubleshoot this. What am I missing, what am I reacting to or what am I doing wrong, can you pinpoint anything? My only available choices when I went on the AIP diet was that or immuno-supressants and I very much wish to stay away from the latter, they are very scary things. I want to address the cause and I know my gut’ll take a long time to heal but I was expecting at least an improvement of the lesions in colour and thickness, something that would give me some hope of success. I certainly didn’t count on it becoming worse. I will still give AIP a fair shot but I must admit I’m feeling a bit despondent right now. Again, apologies for length and thank you for your assistance. I have a long list of curses. Scalp psoriasis (since puberty) not severe, but troublesome. Endometriosis (had a hysterectomy 3 years ago), PCOS (still have the ovaries), and seven years ago I was diagnosed with fairly mild crohn’s disease. I recently had a colonoscopy which was just routine and it appears the crohn’s has significantly advanced which was quite a shock to me because I don’t really have many symptoms. That is the same with all my curses, they are just there in the background. What I do feel I suffer is greater fatigue than a person with my level of activity and at times low moods, anxiety and low motivation. I started Paleo 2 weeks ago, working towards doing the AIP after the Xmas holidays as we will be travelling 5 weeks. I feel I can stick to Paleo, but the AIP is best done in the comfort of my own home, I would think. I feel better already but I am confused as I don’t suffer severe symptoms as to how I will know if I need to go onto the AIP. My question is the hormonal component. I keep telling my doctors my problems are so cyclical (changes in bowel movements, energy, headaches and moods can be predicted on a calendar). For a few days at a time I am on top of the world, no matter what I eat and then for a week at a time I am as good as useless. I am kind of looking forward to my ovaries giving up, but according to tests, that is not anytime soon. I am 45. I have bought and read both your books cover to cover. What’s the deal with the hormones? I have been like this for years. My husband had it for years, until he got off ALL gluten. Then it 100% cleared up. Hi, do you have any suggestions for treating sebhorrheic dermatitis? Mine seems to have worsened on the keto diet and I believe has been made worse by using coconut oil. I’ve kind Of gone the other way, I’ve been primal for around 4 years, with more cheating than I’d care to admit, but the amount of non primal foods I was consuming was steady and not extreme, ie I’d have a cookie or piece of cake, but for 4 years that was fine. I recently had a sore throat and runny nose, which lasted longer than normal, after not having one for over a year. Straight after it cleared up I developed psoriasis. I went to my doctor to confirm it was this, who said psoriasis can be caused by a sore throat (obviously she didn’t mention it was an autoimmune disorders) then didn’t use the cortisone based cream she prescribed, as I had read bad things about this. My question is should I immediately try AIP to heal, or stick to a more conventional Paleo diet first, as this has been ok in the past. I never had a problem with dairy, that I could recognise physically, and even when I did eat sugar or drink alcohol it never really affected me too negatively, in the grand scheme (I know I would have been causing damage somewhere, I’m not naive). It just seems strange that I’ve developed it after being on a similar routine for 4 years. The lesions are starting to itch now, after 3 weeks of no itching. Can anyone advise? I’m not Paleo Mom Sarah, nor am I a doctor, but I have had psoriasis since birth (41 years). A sore throat is not correlated to psoriasis. Strep throat, on the other hand, is. It can cause severe flares, particularly of guttate psoriasis. If you didn’t have active psoriasis before, you’ve suffered an immune system response that has kicked it into gear. I’m sorry about that. There’s no cure, so really, whatever you can do to minimize stress, get good sleep, and eat in a way that doesn’t inflame your psoriasis may help. Your body will tell you if your diet is the correct course or if it’s actually causing you more stress. Anything you can do to avoid inflammation, get healthy fats, Vit D, etc. is *likely* to help but not guaranteed. It is a complicated condition, and it won’t be cured by diet alone. But yeah, refraining from sugar, liquor, etc. is a good idea right now. If you don’t want to use corticosteroids or other creams, do some googling and look for ways to support your skin during the winter months. My friend makes a thick cream for me using coconut oil, shea, and other natural ingredients. Univ of Michigan used to make its own cream for its psoriatic patients — other medical centers may do the same. UV therapy is expensive and hard to find in certain regions but can help clear you up in the winter from a strep flare (I had 85% of my body covered post-strep, so I speak from experience). Hang in there. You didn’t develop this from your diet, and you didn’t do anything wrong. You have the genes, and it would appear that you had strep throat. This is a common pathway for a flare, regardless of any dietary intervention. You got unlucky. For what it’s worth, I was pretty strict VLC Paleo (with some dairy) for 2 years and doing awesome, but then developed what I believe is eczema. I am 66 years old and never had a rash or dematitis or eczema before. So I was puzzled. My hand had a terrible flare up last late winter and my leg. Right around then, I began to add potato starch and other of the prebiotics, ferments, I was reading about, upping my carbs with safe starches and taking daily probiotics–1 soil based probiotic supplement too. This was all for my gut microbiota which I believe I had degraded because of the too low carb diet (for me) and not much for the gut bugs to munch on. I learned a lot about our immune system connection with the gut. I then read from Mr. Heisenbug blog that the probiotic strain L. Plantarum had helped his hand eczema. I added that and my hand flare up went away. This is the time of the year all this flares up again and since I have been using the prebiotic foods and probiotics regularly this past year I have only had a couple of little itchy spots and none on my hand. This is the way to go for me. I tried eliminating histamine foods and that didn’t help much. What about cinnamon, carob, clove and poppy seeds during AIP? Thanks! It’s quite hard to know what actually inflames it, but right now I’m thinking it’s whatever I’ve eaten right before I start itching, as apart from some fabric irritations, it’s quite mild and doesn’t cause me too many problems, apart from the fact it looks awful! I have realised coconut affects me badly, with bloating and stomach ache, and have also cut out dairy, coffee, alcohol, sugar and eggs, for now, to try and clear it up. I’ve upped my carbs with plantain and up to 20g of fructose a day, and think I may be seeing some improvement. I’ve read that as it starts to heal the bigger lesions start to break up into smaller ones, which I think is happening, although I may just be getting new ones I suppose! I will stick it out for a few months, but if I have had no improvement I may have to go full AIP. I am also going to try using coconut oil directly on it, starting with the first lesion which appeared, and see how that goes. I’m already cooking almost solely with it. We’ll see!! Great article. I have psoriasis and have had great success with a very low carb diet. However, I get famished and grumpy 🙂 and can’t stay on it for long. I am learning about fats and trying now to include them in my diet. They seem to help tremendously. Can I ask you to share good sources of fat that I can start eating. I have found that avocados work great but not quite sure how many I can have given the O6. If you limit carbs you must eat equivalent calories of fat in order to have your body function. You need the fats to run on so too low a fat consumption will make you feel terrible. Get enough fat from any source possible to make this work. Coconut oil, grass fed beef tallow, pastuered lard and grass fed butter are all stable oils for cooking. Good quality organic virgin olive oil on salads or anything just don’t cook it. Figure out your calorie run rate and then figure 70% of that should come from fats and 20% protein and 10% carbs. I eat full fat cheeses, organic heavy cream for sauces and coffee, fatty meats, etc to make that fat load…when you do you’ll find you automatically lose weight if you need to. I thought coffee was a no no??? I am reading so much conflicting information that it’s stressing me out. I am so with you, Cecil. How do you know that “we are people who can/can’t…?” Is this from your own personal experience or do you have a lot of experience treating people with psoriasis? I know that everyone has different triggers and that AIP deals with the most common ones, but how do you suggest that people with psoriasis can’t handle much sugar from fruit or starchy vegetables or any dairy? I am trying to do AIP, but hearing that I can’t even eat a sweet potato is just too much. Yes, the no sweet potato is a real blow..I have it for lunch most days…what can I have that will fill me up? you would be able to have it if you made it a resitant starch by boiling it and letting it cool in the fridge for at last 12+ hours before consuming. Love your book, just found your web site and blog and am about to embark on the Paleo to help autoimmune disease. Your article relates to psoriasis which I have in minimal areas but does it also relate to psoriatic arthritis? I have been diagnosed with psoriatic arthritis 12-18 months ago and although the nsaids and dmards help a small amount I’m sure they are doing more harm than good. My rheumatologist is about to start me on Humira but obviously I would rather find a more acceptable form of treating the disease. Here’s hoping. If it helps, I was diagnosed with psoriatic arthritis about 4 years ago (I had mild psoriasis for years before that). After doctors failed to give me any hope I found a book by Dr. John Pagano for healing Psoriasis which outlines a diet very similar to the one described in this blog (I discovered the PaleoMom website today whilst searching for a lamb stew recipe that would suit my diet), and started following it. I wasn’t strictly 100%, but I did eliminate all nightshades and most of the other no-nos for most of the time. Result was that after 2 years the Psoriatic arthritis had gone completely, and I am now back to running and playing volleyball like the doctors said I would never do. The psoriasis still remains a bit (although less than before), but I have relaxed the strictness of my diet (for example I now have a cup of coffee per day) and am getting a good feeling for what still keeps me in the health zone and what is too much for me (for example a one-week business trip in India eating everything I was served caused some joint pain to return. It went away again a few days after returning to my normal lifestyle). So I am not scientific evidence (the Doctors didn’t want to see me again after I stopped taking their medication), but I think it is worth trying out. You definitely have nothing to lose by going on the dietary recommendations presented here. Tengo psoriasis y tenía artritis psoriasica. Empecé con la dieta Paleo el 1 de julio de 2015 y a los 15 días abrí una botella de agua. A los 3 meses dejé la medicación. Llevo 4 meses sin medicación y muy bien. La psoriasis aún no tengo mejoría. Are all skin conditions, at the end of the day, caused by gut dysbiosis? That is, if one’s skin is anything but clear, are those blemishes an indicator of intestinal permeability? By extension, can all skin problems be resolved by restoring the integrity of the intestinal lining? I am speaking with keratosis pilaris in mind. Thank`s for sharing. I also suffer from Psoriasis. I might be a sensitive to nuts, too. But can you explain why nuts and seets are harmful for people with P. ? Perhaps I’m confused, but you listed eggs as something to avoid, and then proceeded to list them as a food to eat (pastured)…can anyone clarify? I think she said egg whites, it’s ok to eat the yolks. Reading your article brought tears to my eyes – you are the first person to address what I’ve been suspecting all along: I’ve stomach issues all my life, poor sleep (even after taking sleeping aids that left non-functioning the next day), suffer from depression (among others) and just recently diagnosed as pre-diabetic. You are also the first person that doesn’t preach “cure” or gimmicky options, and I truly appreciate that. I’ve not tried the autoimmune protocol yet, but I plan to delve into it, as well as dedicating to the other areas you discussed. Thank you – you’ve encouraged me more than you realize. I suffer from stage 3 HS and have done multiple skin transplants but progressively getting worse and worse over the years. I found the AIP diet about 5 month ago and I noticed improvements in the “general conditions” like fatigue in just a few days. Then as time has progressed I do experiance improvement in my boils (frequency of outbreak, healing, pain etc) for the first time ever (it has always bin up and down but now a bad day is like a decent day before). I will eat like this for the rest of my life if needs be. This is a game changer. For real! I’ve had mild psoriasis on my elbow for the past 15 years. I’ve used creams, sun exposure….and it came and went but never disappeared completely. In 2007 I sprained my ankle and within a year I got psoriasis on that ankle. The swelling never went down completely and a friend thought I had psoriatic arthritis….Never diagnosed. So I just dealt with it. In 2012 the Paleo diet started trending. I didn’t know of any correlation it had with correcting psoriasis. I was in a competition at my gym so I decided to try it just for weight loss. It worked, but also I noticed within one week my psoriasis was completely gone, aches and pains gone, and my energy level increased . I couldn’t believe it. I was sold and continued for three months on Paleo. When the competition ended I gradually went back to old eating habits but still no psoriasis. Now I’m finding it has reappeared and I’ve never been so achy. It also spread to my other elbow. I made a decision this past weekend to go back to Paleo because I no longer want to suffer needlessly from psoriasis. So we’ll see. I didn’t have an issue with eggs or sweet potatoes in my diet before when it disappeared, so I’m anxious to see if I get the same results that I did in 2012. Thank you for this info….I’ll be checking it along the way. It may be the gluten intolerance. I posted this elsewhere but I am wondering- does anyone know if this is safe for pregnant/nursing women? I am concerned with all the restrictions if the baby will be getting everything they need. I will of course ask my doctor but I don’t think they have much experience with this. This is an old comment but it could help future mommies- I was gluten free while pregnant and started the AIP for multiple sclerosis when my daughter was born. She is my fith child and by far the healthiest. Our family is always passing around cold etc as my children are in public school but she never seems to get sick. She is now two years old and has only ever had one runny nose to speak of and one day of light fever. I am so pleased that my diet has helped keep her so healthy. And unlike my other children she loves fish and salad! I am in the category of those with eczema and psoriasis, but also being histamine intolerant makes diet super tricky. I’m sourcing super fresh, shorter aged, pasture raised meat and still reacting if I have more than a little more than once every two day or so. I’m not tolerating broths or gelatin. Feeling so lost! Is there anything we can do to get rid of the post-inflammatory hypo pigmentation after a lesion clears? Thankfully I was able to clear my paoriasis using The Myers Way (very similar to AIP), but I still have white spots on my legs 6 months later. I’ll take the white spots over the lesions, but would love to know if there’s anything I can to do get rid of them. Thank you! From my own experience it will help with rosacea as well. I’ve had psoriasis/psoriatic arthritis for about ten years and very mild rosacea for about the same time or maybe a little longer. It’s never been diagnosed but I get the tell-tale butterfly redness around eyes and nose. Flare ups have been greatly reduced by the Paleo diet and I actually use my rosacea as an indicator of when I’ve eaten something that will worsen my psoriasis as I will get red in the face within minutes of consuming a trigger food. The only thing that has made my psoriasis virtually disappear was when I took a long vacation and had even less stress. Since then, I’ve made drastic changes in my life and now my stress is minimal. The psoriasis has been gone for 7 months too. I guess stress was my biggest trigger?? Great article. I’ve had psoriasis for over 10 years, tried every drug, every cream. My psoriasis covers my lower legs, back of thigh, lower back, elbows and from ear to ear on my scalp. I’ve been clearing a fair amount, by doing the following… eating as clean as i can (as much as possible), losing weight has helped, i exercise at least 5x a week, recenky started tanning and red light therapy, and i use coconut oil, olive oil and A & D ointment on my skin. I did not wear shorts or skirts for years, now my legs are clear enough to show my long legs again. I will try to incorporate info from this article to hopefully improve my comdition even more. Thank you. you mentioned how lucky we are to have psoriasis, vs MS or such. I am not lucky. My Mother lost her life because her psoriasis attacked the lining of her lungs and keep reoccurring and effected her heart and killed her. That is not lucky. If you knew anything about psoriasis you would know it at is all the organs, the skil being visible and the largest organ we see it. Psoriasis also cause a number of other issue, including pain. I think you don’t have a good enough understanding of this disease to assume that it is not that serious. Many people suffer extreme issues that are life treatening. When my Mom eventually developed psoriatic arthritis she could not sleep, walk or move with out extreme pain. As far as your eggs , peppers and such.. That does not apply to all of us. You really need to check yourself before making such remarks because you seriously don’t know very much about what others are living with. Yes Annette, I couldn’t agree more. Psoriasis is not a simple illness and certainly can be serious, even life threatening. I don’t feel lucky to have it. I would be interested to know what Paleo diet experts think of my observations below as I think we may be missing something obvious here, namely; Nightshade fruits and vegetables are unlikely to have ever been part of our forebears / Palaeolithic ancestor’s diets. Potatoes first arrived in Europe from the 1560’s onwards and only became a staple from the 1700’s onwards and consumption massively increased after the industrial revolution and arrival of the railways. They arrived in Africa and Asia much later and still account for relatively little of their diet as starchy carbs come from other sources; rice, yams, pulses, sweet potatoes etc. Tomatoes first arrived in Europe in the 1580’s and were not grown in England for example until 1590. They have only really been part of the British diet since the Victorian period and consumption has increased exponentially in the late C20th century given increased demand for Mediterranean cuisine which followed holiday travel and immigration from the post-war period onwards. Clearly however they were not part of the original Mediterranean diet and they even less part of the African or Asia diets. Eggplant/Aubergine – this original was originally domesticated from the wild nightshade species; one in South Asia and East Asia. They only came to Europe in the mid 1500’s and in Britain and Northern Europe for example they have only been part of our diet since the late 1960’s onwards; once again in line with holiday travel to southern Europe and SE Asia and interest in the perceived ‘traditional’ cuisines in these areas. They are also not part of the original Mediterranean diet. Anecdotally my psoriasis completely cleared up when I spent a month in Thailand and I had always assumed this was because of exposure to the sun, relaxation and swimming in the sea. However lengthy holidays in sunny Spain, Australia and Florida never saw my psoriasis disappear quite like it did in Thailand. I now think it may have disappeared because whilst I was in Thailand I didn’t eat anything with potato or tomato in it and at the time I couldn’t handle anything with chilli peppers in it and really disliked eggplant. I am definitely going to avoid Nightshade fruits and vegetables for a while and see if they have a similar effect on my psoriasis especially as I now have suspected psoriatic arthritis in my ankle – which has been extremely painful. Psoriasis affects people of all racial and mixed racial backgrounds and I have Indian, Spanish and North African friends with it. My ancestry is English and Irish – I think my Irish family will be amused to see me avoid potatoes but to be honest they were never part of our Palaeolithic ancestors diet. I will let you know how I get on as I’d rather address my diet and use food as a medicine than take man made pharmaceuticals. Please let me know what you think of my observations above? I suffer from eczema for over 50 years. It covers about 70% of my body. I did the Whole30 diet for 50 days and saw some small changes, but during the diet my skin broke out badly and certain areas have not yet healed and it itchs very badly. I would like to try the AIP diet, but I’m concerned about two things. On the protein side, if soy, legumes, dairy, seeds and eggs are off limits and I am allergic to peanuts, tree nuts, fish and shell fish. What is left for me to eat? I cannot see myself eating beef, porc and chicken three times a day. That’s just too much meat for me to digest. I tried it on the Whole30 diet and I sometimes felt like throwing up. Also, week 2 and 3 on the Whole30 diet were very difficult for me since I was always tired and had brain fog almost constantly. I just could not concentrate. I ate a bit more fruit and starchy vegetables to give my body the sugar it needed. I think the brain needs a minimum of natural sugar to function. How do you get by on only meat and vegetables? It seems very drastic. I am trying to eat a healthy diet and have cut out sugar, dairy, most cereals, soy and legumes. Disclaimer: I’m not a doctor. If you’re allergic to all of these things, it probably means that your gut microbes are in total disarray. No wonder you have eczema in 70% of your body, and you’re allergic to healthy food like shellfish. Your gut is what you need to heal: go for the AIP protocol, with a lot of home-made water kefir (e,g, in smoothies), veggies (don’t eat too many cruciferous ones in the beginning though, but then add them more, and especially do eat some unpasteurized kimchi and sauerkraut), home-made bone broth almost daily in veggie soups, and the rest of the foods allowed in AIP (minus the ones you’re allergic to). Get some DHA fish oil (not one that has too much EPA in it), D3, Magnesium, and K2 Mk-4. Wake up with the first sun to walk outside, your skin needs to see the sun (before the sun becomes dangerous later in the day) because we evolved with it. Sun is life. I have been reading your articles and have ordered your book. I am planning on starting the Paleo AIP diet as I have been suffering from Psoriasis for about 10 years now and prefer your route instead of taking western medicine. I wanted to ask if I should start with a cleanse before starting the diet? If so would you have a recommendation? Hi! I am dealing with leaky gut and a lot of food intolerances, including a lot of healthy fats such as olive oil, coconut oil, ghee, fish, etc. I also have recently developed scalp psoriasis, which I’m guessing is a result of the leaky gut. Any recommendations on good fats because my fat intake is little to none at this point?? What are thoughts about using animals fats such as beef tallow? Can consuming such fats make psoriasis worse? I have moderate Psoriasis that I have had for 40 years and continues to very slowly get worse. Thinking about trying the AIP diet. Seems to me it would make sense to get tested for leaky gut before eliminating all of those foods. Cyrex Array 2 test does that and from what I have read is pretty darn accurate. So if it happens to turn out I do not have a leaky gut, then there would be no sense in eliminating those foods, right? How does hemp usually affect psoriasis ? Is hemp hearts and hemp protein OK ? I’ve been battling psoriasis for 9 years now, and recently (about a month and a half ago) I began following the autoimmune protocol. Within a month my skin was almost entirely clear, so I decided to reintroduce something. That proved to be a BIG mistake. I should’ve been more patient and waited longer. Anyways, I tried eating white potatoes because they are my favorite food. After two days of eating very small quantities I had a major flare up all over my scalp (where the majority of my psoriasis has been) and also a spot on my face. Only when the psoriasis has been at its worst does it appear other places than my scalp, so I knew this was bad. It’s been 2 weeks now and my skin still has not cleared. Any idea how long I can expect it to be before I’m clear again? Or should I be expecting to start from scratch again? Hello 🙂 I also have psoriasis, primarily severe scalp psoriasis but I don’t feel any gut issues with fruits and sweet potatoes. would you still recommend cutting them out? Are gut issues the only indication to whether or not my body can tolerate them or could it be that they upset my immune system in a way that doesn’t cause gut-related symptoms? thank you!